Our experience and knowledge of the sport will guide and nurture you into the wonderful world of one wheeling. Choose the right Uni, join the community. Last year I promised that if I did a sub-3 Shova on my road bike I would do it this year on my unicycle. When I snuck in at 2:57:10 I was elated … until I remembered my promise, and suddenly a bit of angst set in. 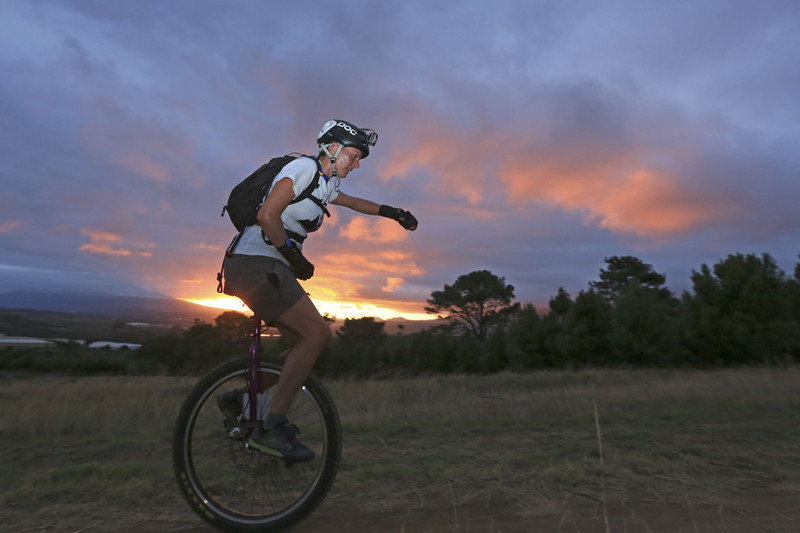 I roped in my good friend and fellow unicyclist, Shaun Murphy and together we set our minds on the challenge of doing the 2016 Tsogo Sun Amashova – 106km from Pietermaritzburg to Durban. We contacted the organisers to see if they would allow such madness on the course (secretly hoping they would say no). Not only did they allow us, but they went out of their way to accommodate us and the cause we were riding for, auSOMEtism. 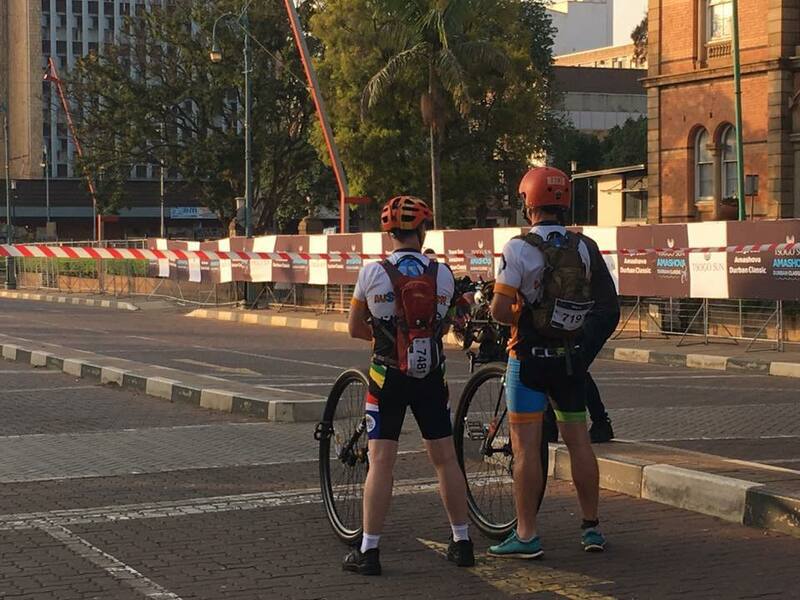 And so it was that Shaun and I found ourselves on the start line outside the Pmb town hall at 06h35, 10 minutes ahead of the pro/elite group, staring down an open piece of road with the daunting task of 106km ahead of us. I haven’t mastered the art of launching the 36” wheel properly and often need 3 or 4 attempts to get going. The added pressure of TV, photographers, announcers and all the pro’s looking on was a recipe for an epic fail going viral on YouTube. My BMT shone through and I mounted the Yardbird like a boss. 1st attempt and I was rolling. 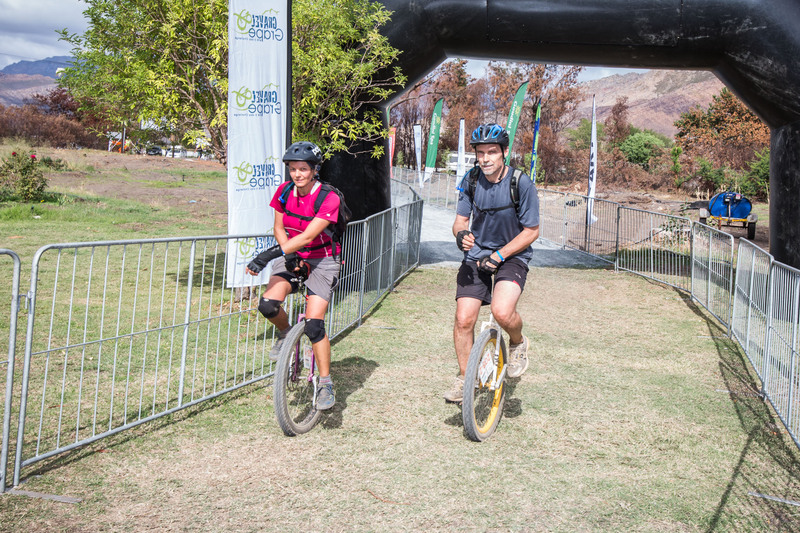 For about 10km the Shova was officially led by two unicyclists. 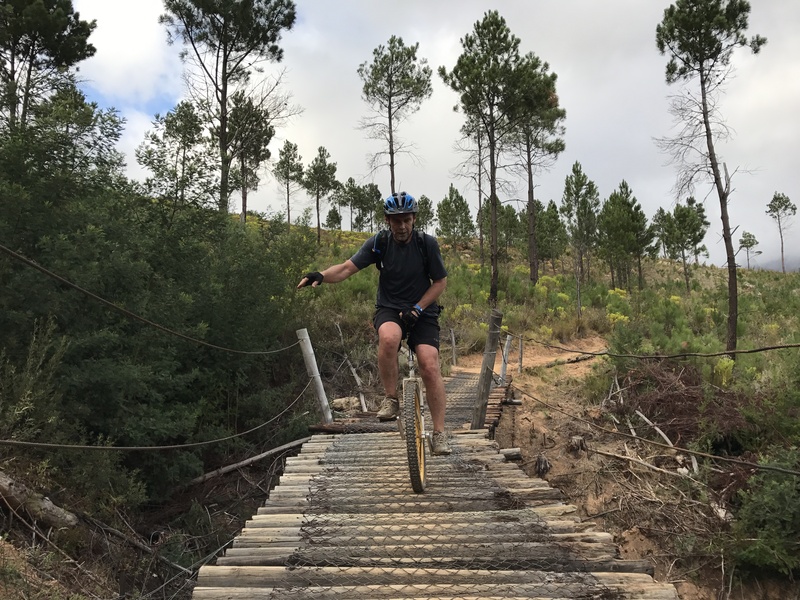 Once over the big F-word; Fox Hill – a 13km climb designed to hurt a unicyclist, I got into cruise mode and was making excellent time all the way to Cato Ridge – and then the wheel came off. Something jammed my brake and one moment I was cruising at 22kph, and the next instant I was flung on the tar like a child tossing a rag doll in a temper tantrum. Bruised, bloodied and a bit shaken, I never quite regained my rhythm or confidence. My disk brake was not working quite as well as it could have and I still had the downhills of Drummond, Botha’s and Field’s to negotiate. None was easy. It was never going to be a walk in the park and the last 20km proved to be very challenging. The wind had picked up by the time I hit the city bowl and the swirling gusts between the buildings almost undid me again. It was great having my son Rivers come riding out to meet me at Tollgate bridge and keep me company for the last couple of agonising kilometres. Crossing the line just shy of 6 ½ hours to the applause of the crowd lifted the spirits and then discovering that the whole East Coast Cycling Club had waited for me to arrive at the hospitality tent was especially touching. Shaun had his own tales of attrition as he battled through loose cranks, cramps and saddle vs buttocks to finish in 7:08. And of course, the huge generosity shown by so many people in donations towards the auSOMEtism NPO. Next year I’ll go for a sub-6. A short while ago, a friend contacted us about constructing a spacenet for his new house. This may seem an odd task to be asking a unicycling company to undertake, but naturally there is a back story. A mutual friend of myself and Donna, Sylvain Burki, passed away tragically at the end of 2015. As a memorial and honour of him we held a Park Play Session and constructed a massive spacenet reminiscent of those constructed by Andy Lewis and the Moab Monkeys. The spacenet resembled a glorified dream-catcher design. Based on this, we were apparently the most qualified team to take on the task of building Charl’s net. Many nets are constructed by using a bend or knot that does not isolate each mesh of the net, the dream-catcher design for example. 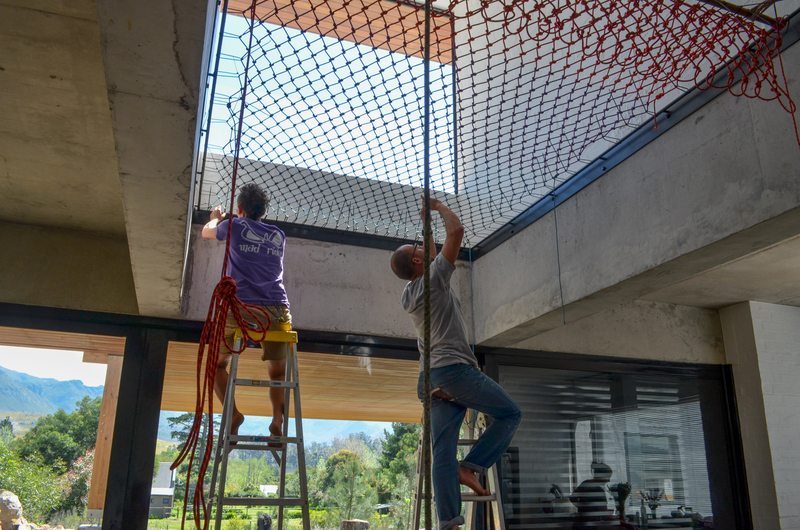 This was unsuitable for our purpose, as we wanted to ensure maximum safety and even spacing between each mesh. It was clear that children would be the predominant users of this net, so small mesh sizes and safety were absolutely imperative (not that safety isn’t imperative for adults too!). It became a toss-up between a reef knot net configuration and a traditional fisherman’s netting knot. Both are aesthetic knots, and suitable for our purpose, but would create a slightly different weaving pattern. In the end we chose a traditional fisherman’s netting knot. We managed to find samples of each colour we intended to use. We chose a Dyneema Super Lite rope for a couple of reasons. Dyneema has a wonderful specific strength, and in combination with a resilient polypropylene sheath allows for a small diameter rope with sufficient strength and durability for the task at hand. We chose 5mm as it retains a good strength, whilst not being too thick and cumbersome neither too thin and painful under foot. Luckily Southern Ropes makes this rope in a number of vibrant colours. OddWheel Unicycle HQ went on a road trip out to Grabouw to investigate the much anticipated space we would construct our net over. 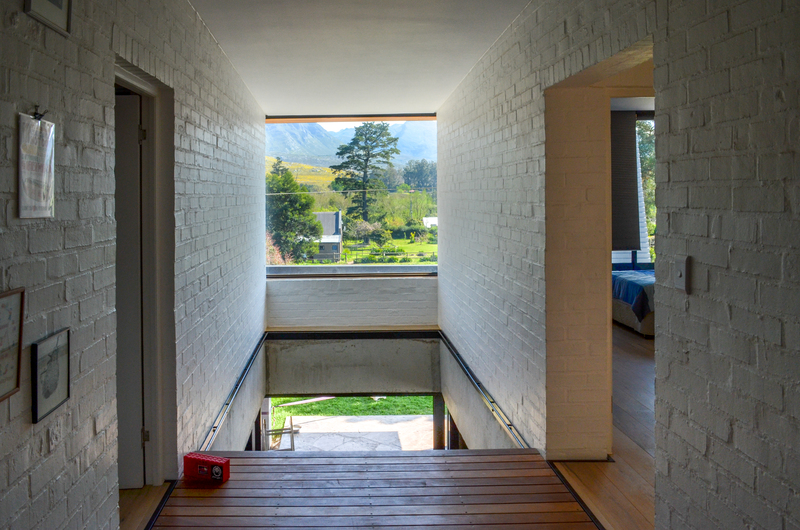 The house is situated in a stunning location, overlooking the Grabouw mountain range. 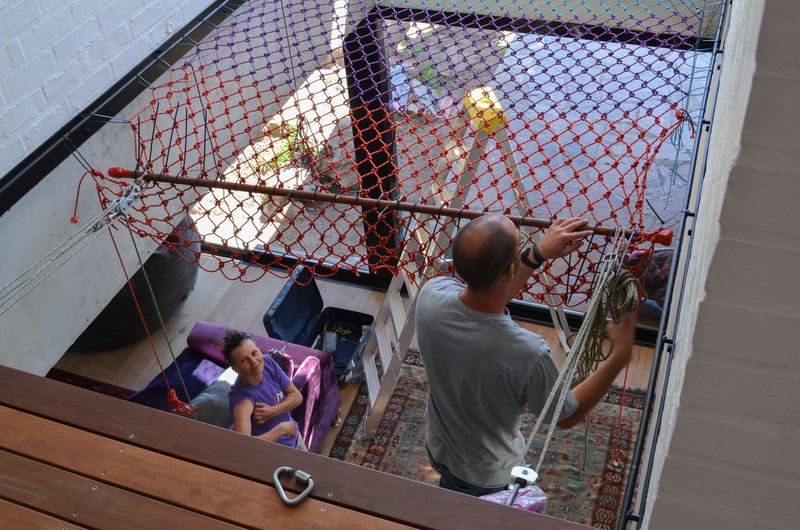 The house is modern and industrial in its architecture, yet elements of playfulness are apparent throughout the house. Getting to business, we measured up the space for the net at 3050 x 1900 mm, and mentally measured up the task we faced. In order to give a rough approximation of the length of rope required for the project, some simple algebra could be implemented. If our length is seen as the hypotenuse of each triangular block of the mesh, then by dividing the total length by the root of the sum of the square of the other two sides (mesh size) c.f. Pythagoras’ theorem, we can work out how many blocks the length and width of the net will comprise of. Furthermore, we can then work out how much rope is required for each block, and “hey presto” we have an approximate length. In this calculation I incorporated the length of a knot for each block when dividing by the total length to ensure we didn’t make too many blocks. Likewise, the length of rope necessary to make each knot was also included into our rope length calculation. 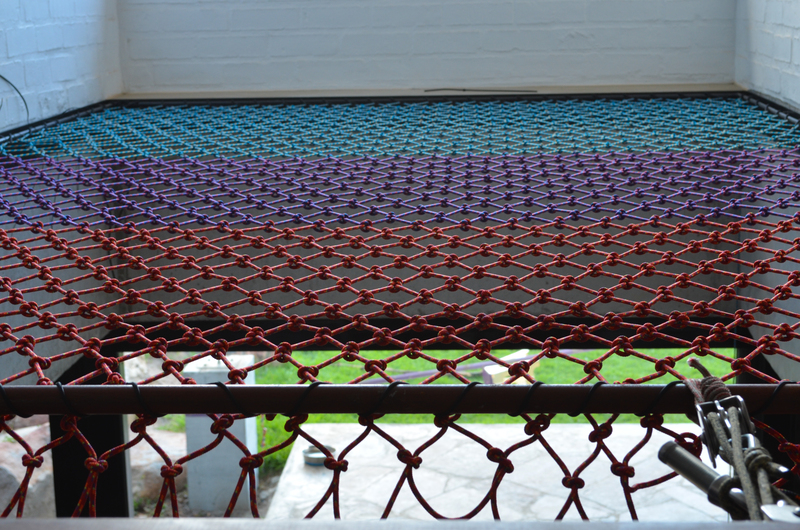 In our endeavor to get rope with pretty colours, we went on quite a wild goose chase around Cape Town. In the interim time between our telephonic enquiries and actually procuring the rope, someone seemed to have bought out all the 5mm Dyneema Super Lite rope! After a trip into the CBD, whereby a shop owner gave me a false promise of ocean blue 5mm Dyneema Super Lite (it was actually 6mm on closer inspection) I was off to the manufacturing plant of Southern Ropes for a brief sojourn around the factory floor trying to find the manager, who could sell me a roll. Eventually the day came to a close with all three colours in hand, just in time for evening traffic for my victory lap home. The next day we set about actually starting the weaving process. After a significant portion of time trying to establish the intricacies of “casting on” the rope to begin the process, we were eventually under way. The bulk of 100m of rope proved a struggle whilst weaving, but we were apprehensive to cut the rope into sections. Hence it transpired that we pulled through the entire rope on each section of tying the knot. Work to make severe callouses and tired forearms. Whilst we threaded spaghetti, I tried to do some mental maths as to how many meters of rope we would eventually pull through in the entire construction, but sheer horror inhibited a final result being estimated. 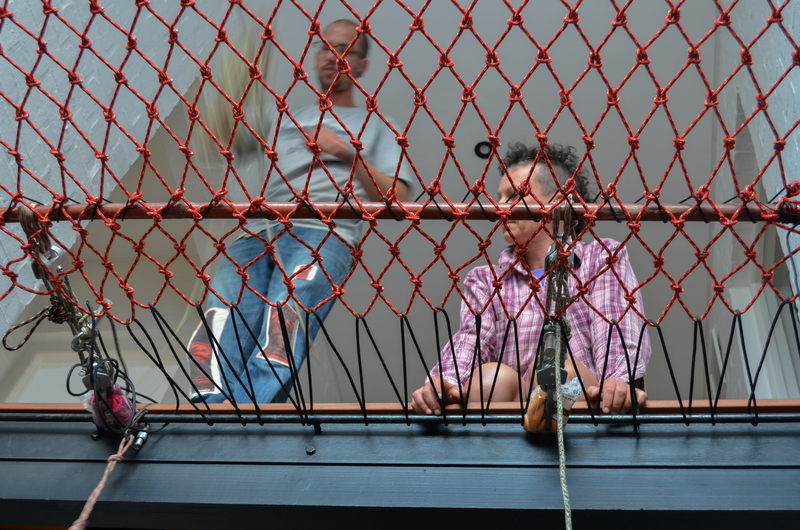 We scrapped the concept of a frame to build the net onto, and instead created a rudimentary loom system. 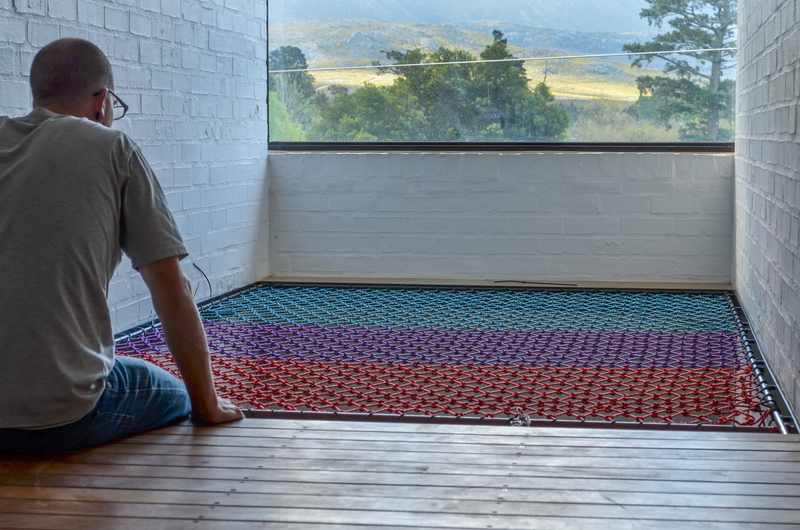 By using two pieces of 38 x 38 mm wood and spacers the knots could be tied onto the previous row of loops with even spaces to create a neat net. Pulling, pulling, pulling… Day 1 resulted in a mere single row of usable net, with a width of 26 meshes. The length was proposed to be 32 meshes; we were going to be here pulling rope for months! We found that by wrapping the rope around the 38 x 38 mm wood and knotting the next loop around another piece of the same wood, a spacer of 100 mm was required. However, after the first row we realised that the 38 x 38 mm wood wouldn’t slide into the mesh since space had been taken up by the knots on each side. Another trip to the hardware store and one 32 mm diameter round curtain rail rod later, and we were back in business. 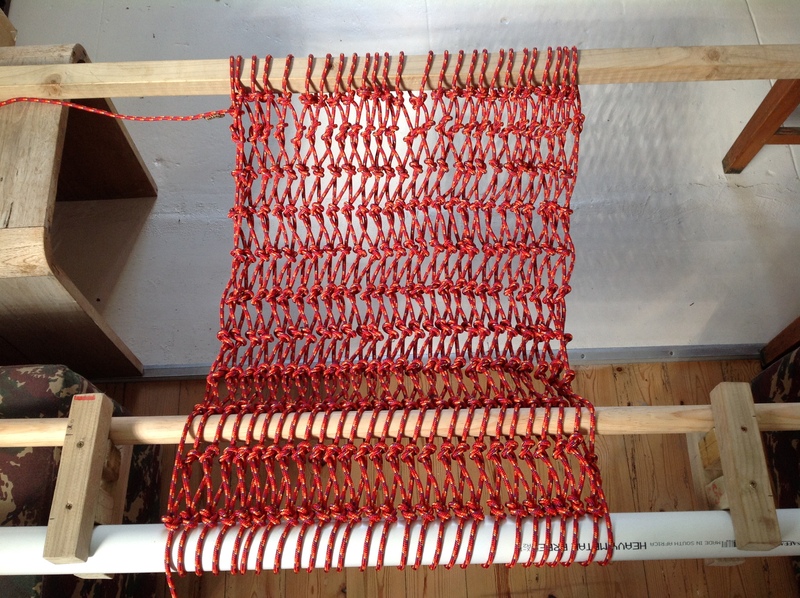 This was now the back piece of our loom, whilst the original 38 x 38 mm wood was implemented on the leading end. However, a couple of rows down, the net was starting to look beautiful, and I was truly proud of the fruits of our labor. There is a beauty to a hand crafted product. Maybe its my sweat droplets glistening off the rope that makes it look so beautiful. At about this point in the process, we found that pulling the latest row of loops off the square 38 x 38 mm wood was ever so tiresome and serious time consumer in the process, so we decided to implement a round object instead, which could easily twist out. By working out the perimeter of the square wood, we found that 50 mm diameter round pole give us an equivalent sized loop. Whilst Donna skipped off to summer in San Sebastian, Spain for Unicon 18, I spent approximately 45 grueling hours hauling rope in grizzly Cape Town winter. I will save details at this point, since I think my mind has blanked much of it out. I would like to make a special shout out to Sir David Attenborough though; whose soothing voice depicting the scenes of our natural world took me through the darkest hours. Countless rows of knots later (probably 46 in actuality) and I had run out of rope. The three colours – red, purple and blue – looked spectacular together. Although I felt proud of the accomplishment thus far, I still had trepidation towards the installation. I had stretched the net out in the garden with a pulley rig and it JUST made the required length. Moreover, it was debatable whether my technique of tensioning the net in situ would be effective. I planned on attaching three edges with cable ties, then pulling it taught with a pulley and bar. I guess I’d just have to wait and see. Well the day finally arrived, and we set off to Grabouw once again. It was a pre-frontal day and highly atmospheric to say the least. After cutting out the original net, we lay the new net down under the space; it looked very small. Anyways, we badgered on, and started by attaching it at the far short end with numerous cable ties. Next, we attached the two long edges. We then took cable ties to a row of knots 5 spaces from the end and attached a steel bar off which we would tension the net with a pulley rig. Thankfully Charl had another pulley rig so we could equalize the tension easily. However, my steel bar was a bit too long so Donna and Charl ran off to a neighbour to source a hacksaw. I took the opportunity to hop onto Charl’s garden midline, which was a lot of fun in the wind. Upon return, progress proceeded, and we hauled in a fair amount of the net – but not nearly enough. I attached the far short end with rope to alleviate the cable ties when they started popping under the tension. At this point we had a delicious lunch to ramp up our motivation and energy, strong coffee included. Things post lunch moved along slowly yet methodically. We de-tensioned and re-tensioned, to get the long edges roped up and in place. We de-tensioned again, this time to adjust the pulleys as they had run out of distance to pull in any more. We got to the final tensioning act, and the net was almoooooost to its full distance. We made a call to attach it with rope anyways, with longer spaces. The reasoning behind this was so that we could hop onto the net and hopefully stretch it in and set all the knots – anticipating we could eke out a wee bit more distance from the net. Well, that seemed to work! We re-tensioned the two long sides, and set about the task of hauling in the final edge. Completion was nigh! By some miracle, we managed to get the net to the other side eventually. It looked truly magnificent. Borderline biblical. Joseph’s Techni-colour Spacenet. After a frolic on the net and some celebratory pictures, we pursued our odyssey home at the ungodly hour of 7.30pm. That made for a 12 hour round journey. But longer than this physical journey was that of the entire net’s construction. 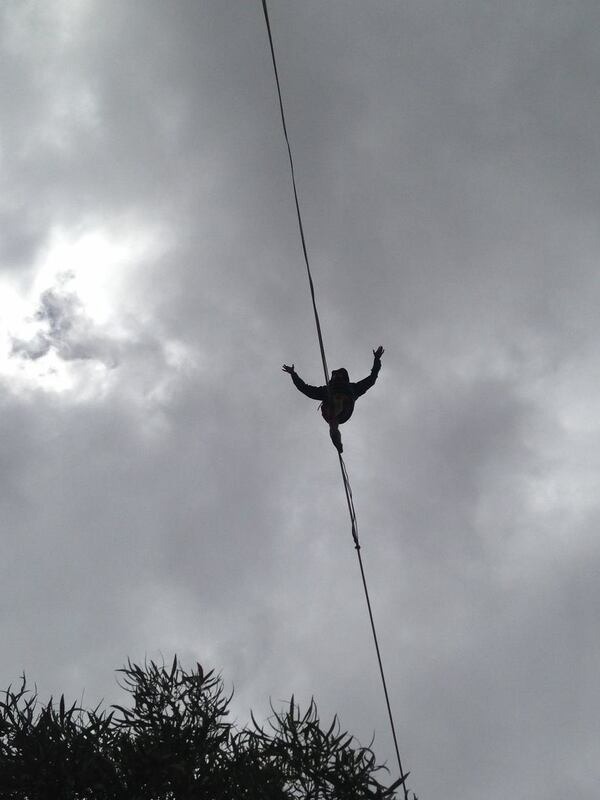 I learnt a lot from it, both in terms of rope work and about myself. Patience. Methodical planning. Perseverance. Etc. Etc. As happy as I am that the net is successfully constructed and rigged, I was a little sad to see it out of my hands. My calloused hands. 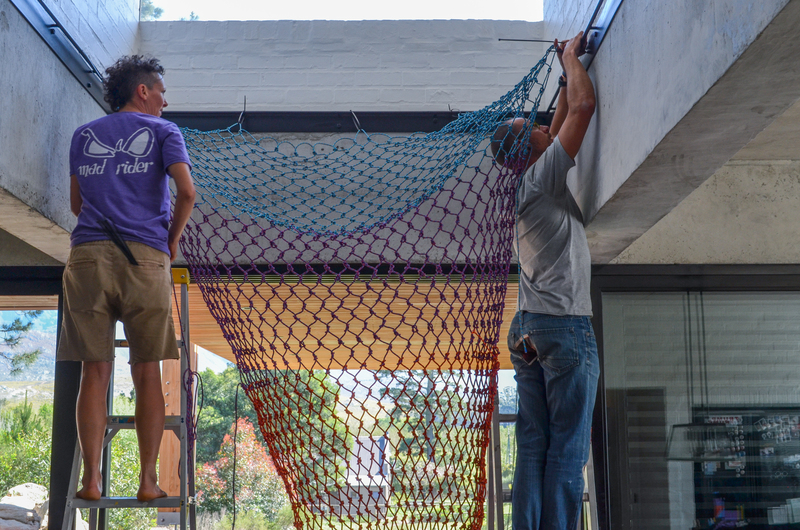 But hopefully I shall return to Grabouw sometime in the future for a luxurious afternoon nap on the net – no weaving allowed! With corrections and slight elaborations by Donna Kisogloo. The core of Owen’s write up is rad as…. and I’ve tried to not interfere too much. I’m a 14 year old who can’t live without his unicycle. 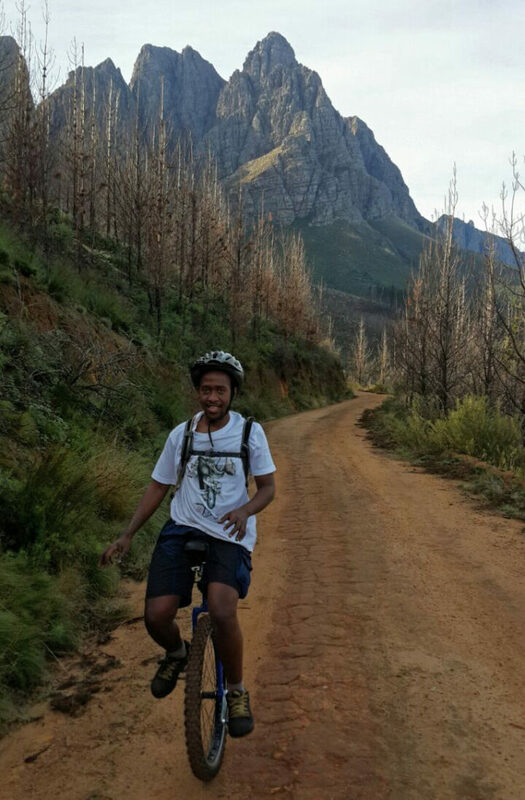 I’ve been unicycling all by myself in Limpopo for about 6 months. I think the loneliness started getting to me so I went onto just about “the only” unicycle website I know of in South Africa, www.oddwheel.co.za. There I found my way to the events tab. 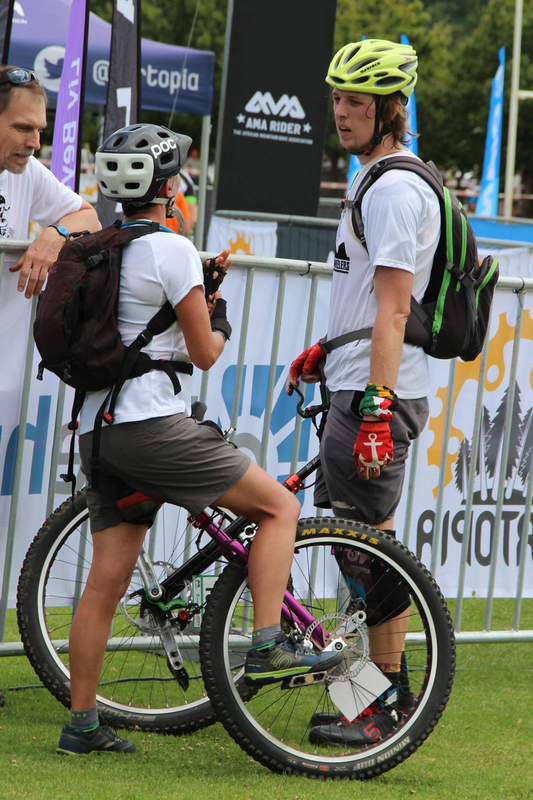 After pages of events all saying location: Cape Town, I saw a picture of a rhino on a unicycle with the title: UniDaba 2012. This is where it all started. It looked like it was a ball, even though the event was 2400km from my home town of Louis Trichardt. I was keen, super keen! I then spent the next few hours Whatsapping and posting on Facebook to find out if anyone knew if there was going to be another UniDaba? The next morning I saw a reply and from there onward the date, location and all the rest were organized! About a year later, I was finding a way to fit a unicycle into a bag with all my other clothes. I did’nt know what to expect of UniDaba but from all the chirps and funny comments on the Whatsapp group I knew there would never be a boring moment and there wasn’t! 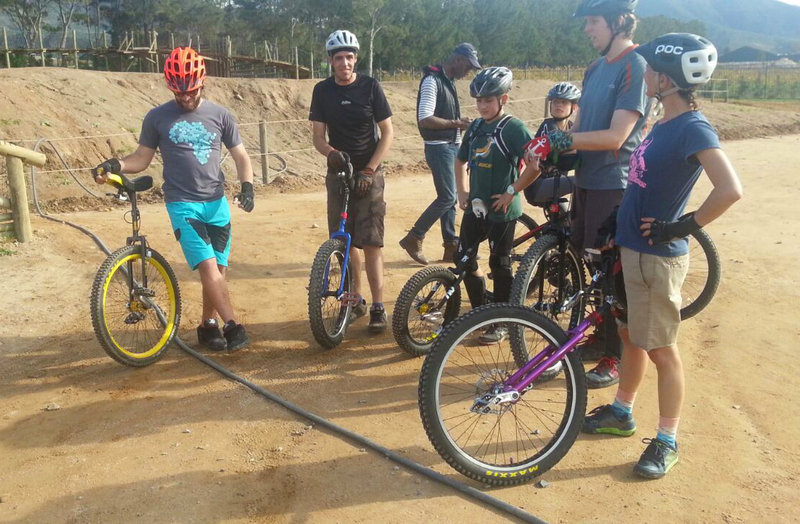 On the first day we kicked off early at the Bike Park on the Constantia Uitsig Wine Estate. This was my first time meeting everyone where I wasn’t asked, “Where’s the other wheel?”. We had an awesome morning rolling around the pump track and expert course of the park but then the competitive side began to surface. We separated into teams of 2 and fought our way through three laps of rocks, logs, drop-off’s and much more! 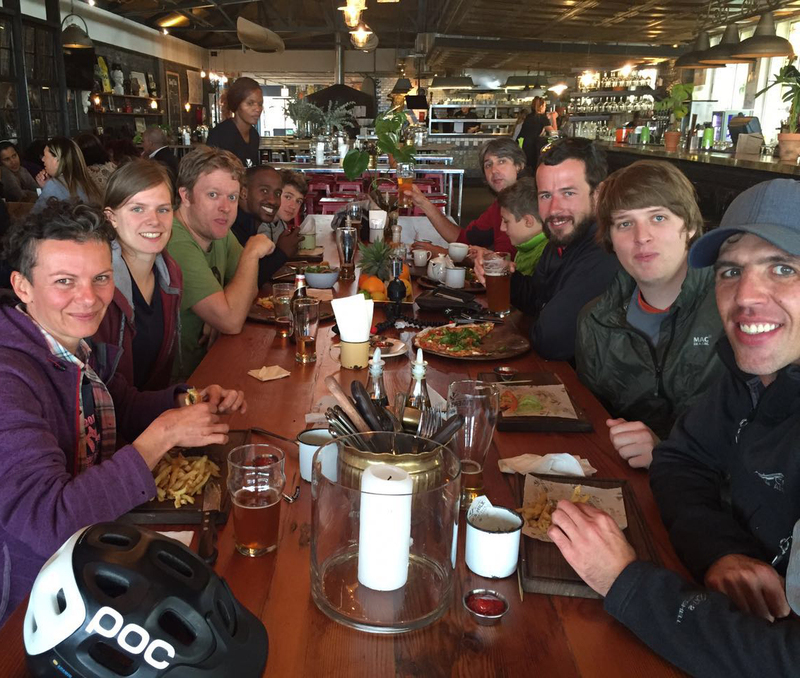 After the morning fun at the Bike Park we decided to get some grub in Muizenberg. We filled up our tanks and were ready for the afternoon ride. 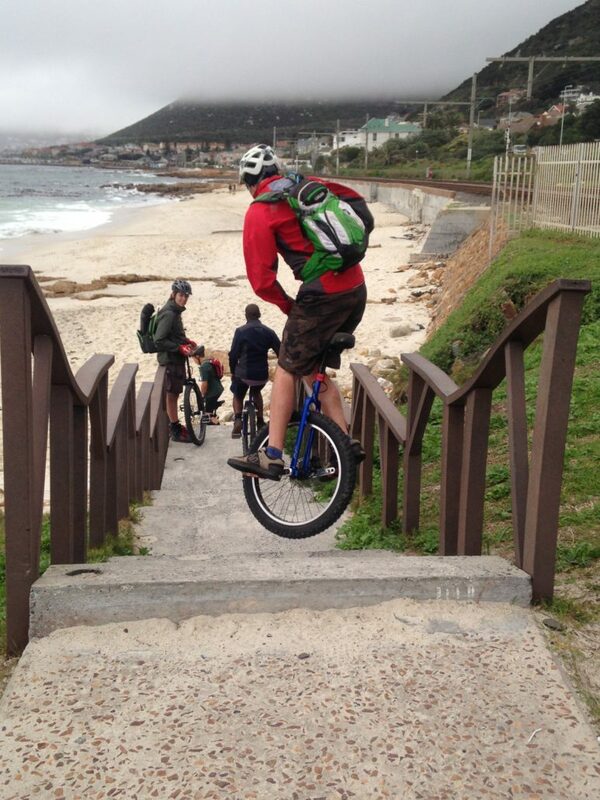 We left the Tiger’s Milk and headed towards Kalk Bay, a 3km fun ride along the beach front. We stopped often and tested our Trials skills on benches, stairs, skinny wall rides, etc. Shaun Devenish getting some air time with his stair hopping. Van Zyl Gunter carefully negotiating a skinny wall. Notice the tongue. 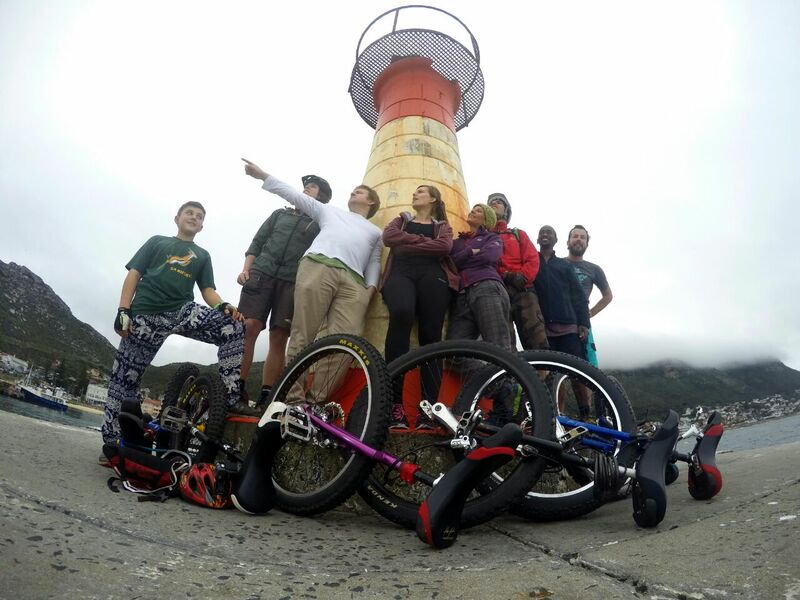 Decorating a lighthouse with unicyclists and their uni’s. 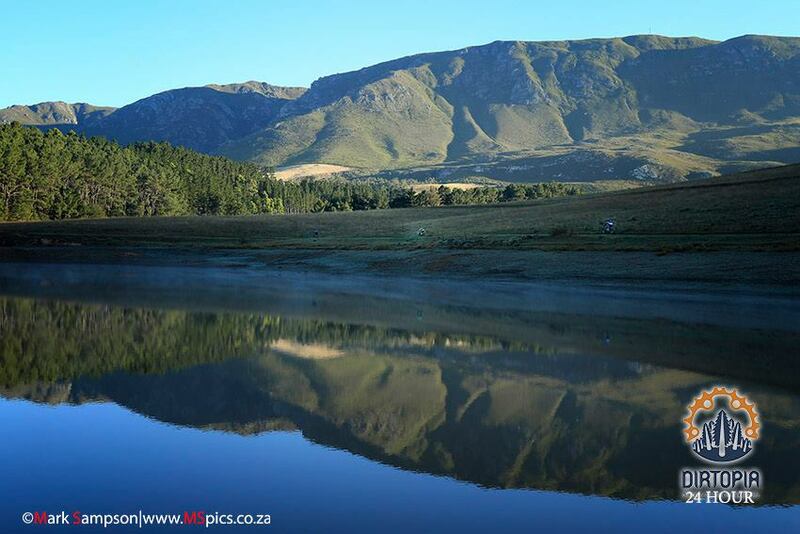 The next morning we kicked off early to be at Jonkershoek Nature Reserve by 9am. This was the start our Muni adventure! We split into two groups and headed in different directions. One group went up the mountain to enjoy the downhill of Upper and Lower Canary, this is the group I stuck with. The other group traversed the base of the mountain on gravel roads. It was a more flat ride. My group spent the next hour, maybe hour and a half “riding / walking” up the logging roads of Jonkershoek, when we finally reached the top we settled down for lunch, tucking into a variety of nuts and biltong! Once fattened up we hit the single-track because what goes up must come down. We enjoyed 3 solid hours of downhill single-track with lots of laughs and lots of bails! We arrived back around 14:30 where I immediately ordered a MASSIVE milkshake and slice of carrot cake at the coffee shop by the entrance. 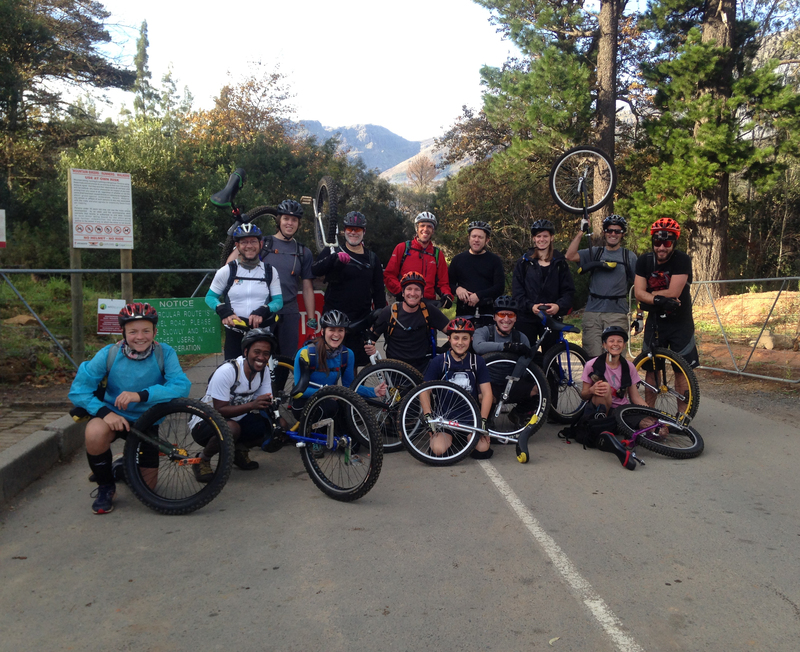 A very happy bunch of Mountain Unicyclists! Something about Jonkershoek and elevation. The next day was the “day of balance”! We all met at The Shed in Stellenbosch and prepared for a day of circus fun! The first hour was a mixture of electric uni’s and giant pogo-sticks. Then later the hockey began! This was my first time playing unicycle hockey so I was quite nervous but I quickly adapted. We spent the next few hours playing match after match of uni-hoki It was a really awesome experience and I recommend that everyone gives it a shot. The next while was spent trying to ride a giraffe and ultimate wheel. An hour later Unidaba slowly came to a end. Owen Venter experiencing a giraffe for the very first time. Can you see the stoke? 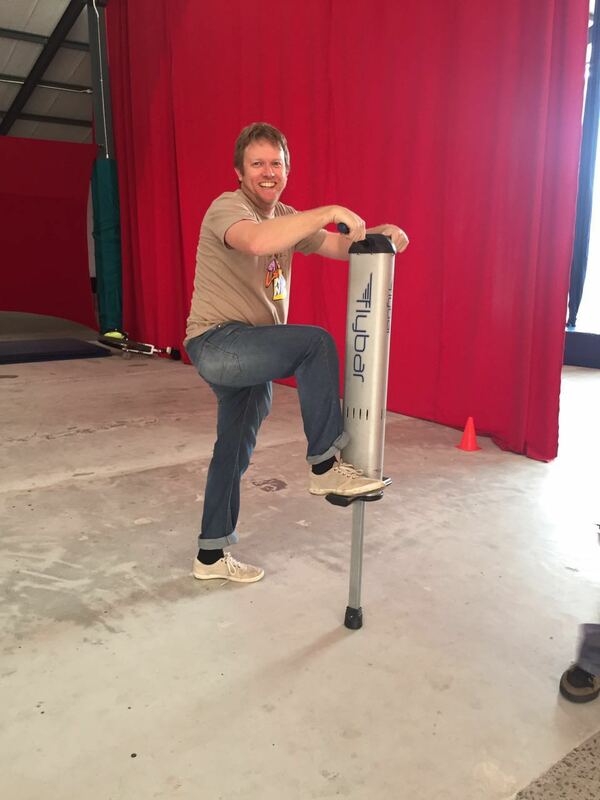 Gavin Stockden mounting the monster pogo. The convention was an amazing experience and I recommend that EVERYONE should come to UniDaba 2017. 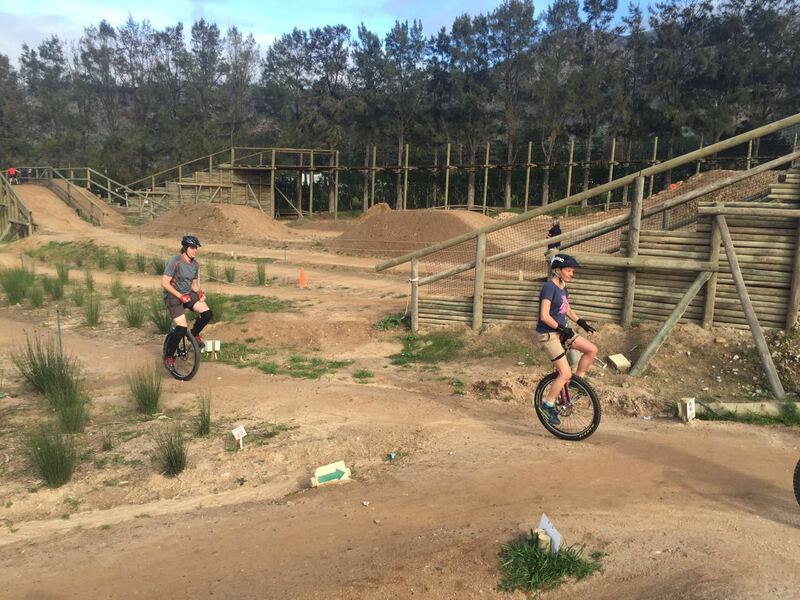 UniDaba was not just a whole lot of people riding unicycles, it was a place were you could grab a few tips or try out some new tricks. It was a place where you could have a decent conversation about unicycling or anything related to unicycling. UniDaba is not just for experts, it’s for everyone! Its for the real pro’s to the one’s who are still looking to learn! I would like to say a huge thanks to Donna Kisogloo at OddWheel Unicycles for setting up such an amazing weekend! 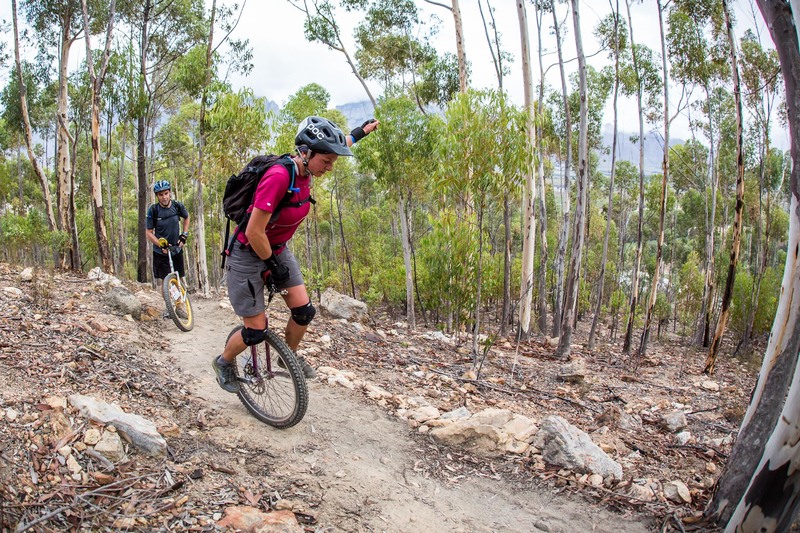 UniDaba is now a permanent event on the South African unicycle calender. It happens every year and happens during the mid-year school holidays. Tell other unicyclists about the event! It’s fun! 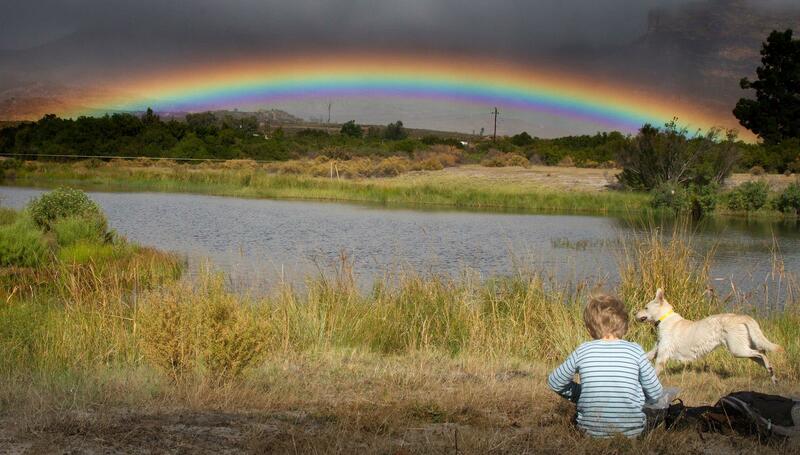 I spent the three days before the highline festival in the southern Cederberg hiking with my family. I wondered why it was that I was feeling a slight apprehension towards arriving at the festival on Friday. I have subsequently come to realise that a large reason for it was a slight trepidation towards the actual rigging of the highlines. I am passionate about rigging, and enjoy the process to a large extent. However, the vast majority of my rigging has been done under the guidance and supervision of Sylvain Burki. As many in our community may know, Sylvain tragically passed away late last year. Sylvain was also the creator of the Rocklands Highline festival some three years prior. The notion of rigging without his extensive knowledge and guiding hand seemed somewhat intimidating and unappealing to me. 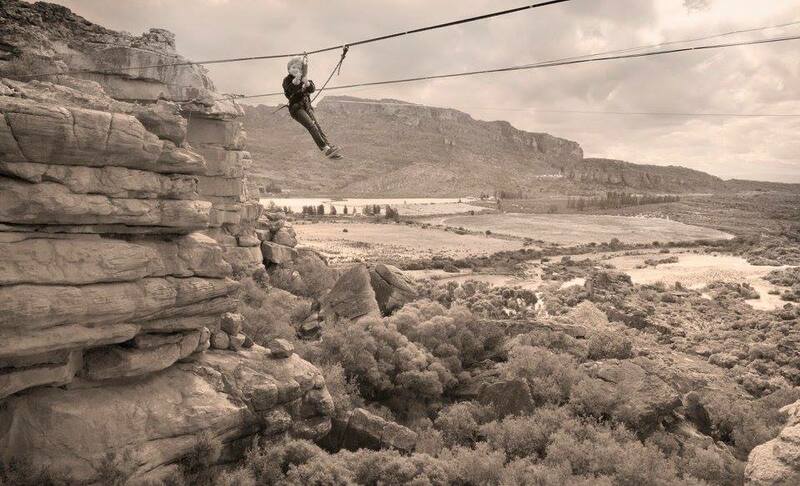 That combined with very irregular highlining in the past year was not a great combination to motivate me. 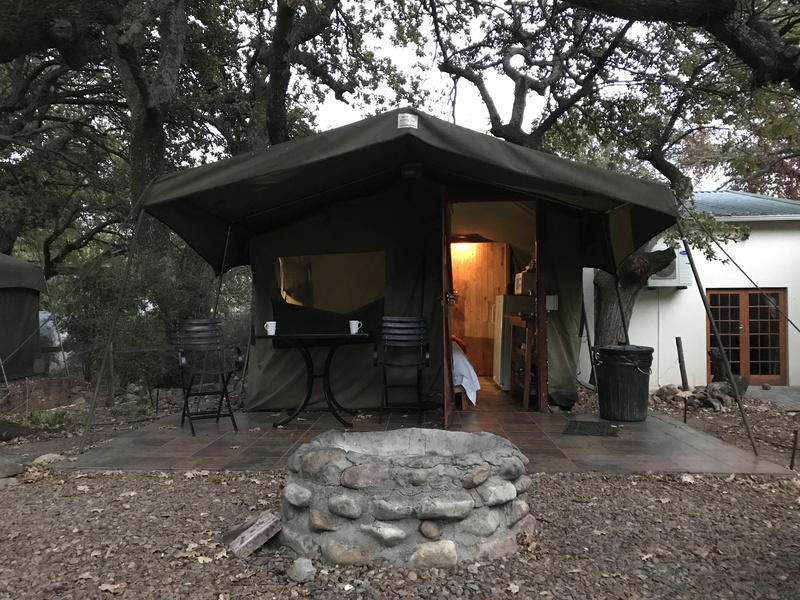 Well Friday eventually rolled around, and my sister and I rolled into the dusty camp of De Pakhuys in my rattling Toyota Yaris. I had barely set foot out the car and was already unravelling a few hundred meters of webbing and sorting gear into my pack to head straight up to the highlines. Kyle Pratt, Burghen Siebert and Jeff van Breda amongst others had already done a stellar job of doing the preliminary rigging of the vast majority of the lines. Andy Court and I were the new old-hand riggers on the block that morning, and we set about finalising the lines with the others. By the gentle glow of late afternoon light, the lines were all successfully rigged, and walking ensued. Immediately it was noticeable the increased number of people at the festival, and more so the huge increase in people successfully walking the highlines! 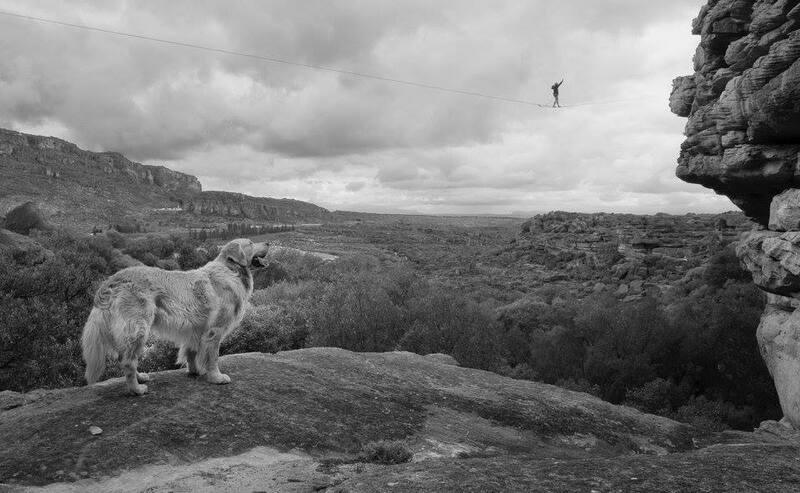 The jarring whip of a highline as someone took a leash fall interspersed the relaxed chatter along the sidelines, invoking spectators to rubber-neck at the downward spiral. 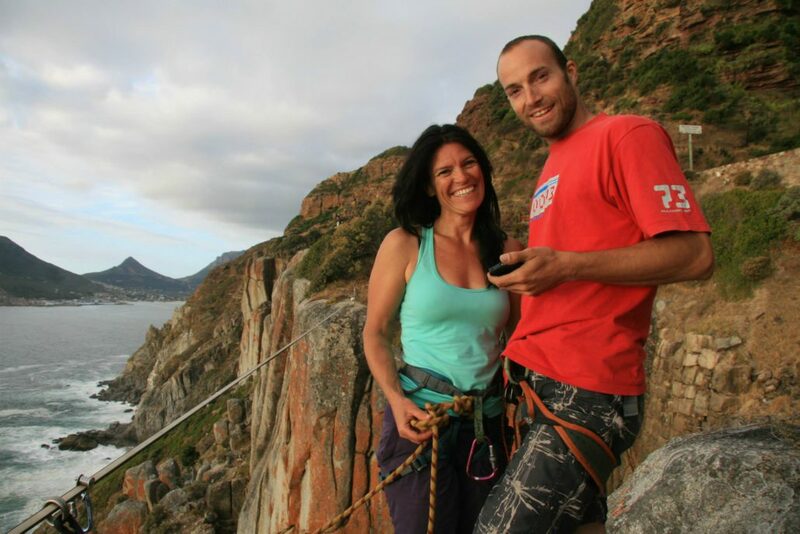 To see friends that seriously struggled to stand up on a highline in previous years now send lines with ease and finesse was a truly wonderful sight. Likewise to see new faces appear out of the woodwork and share with them the intricacies of highlining was deeply gratifying. The psyche of a fresh send is contagious and stoked my fires to give the lines a burn. I did not have serious inclinations to send my project from last year – the 45m highline – but nonetheless had a wonderful time giving it some proper attempts. It was also great to see those with a different talent integrate it on the highlines, such as Toni performing her lyra and vertical silks skills up high. It just goes to show that with a creative mindset there are endless possibilities! 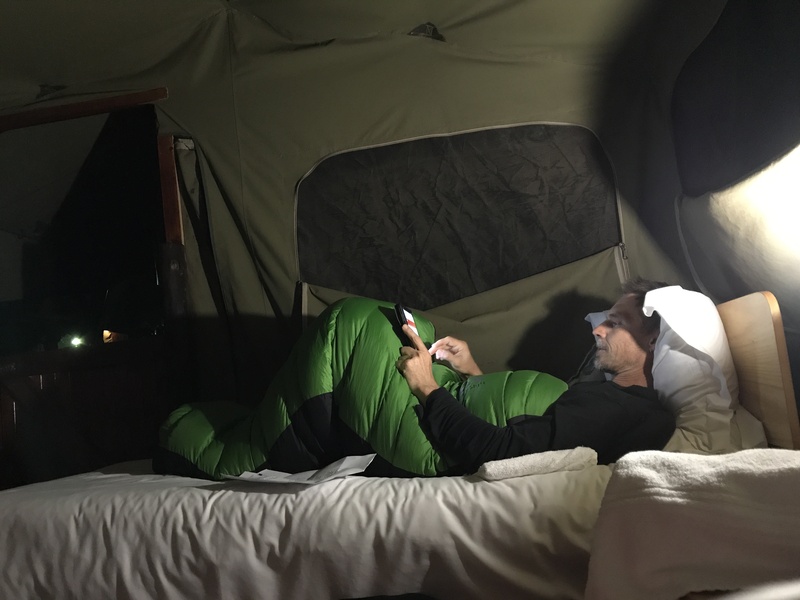 On both Friday and Saturday night Karma played her unmerciful role when I spent a soggy night in a friend’s very unwaterproof tent to pay my dues for being too lazy to set up my own tent – which is very well waterproofed! The rain cleared up with the sight of the rising sun both days though, and conditions for highlining were quite ideal (we don’t dissolve like an Aspirin in a bit of drizzle like boulderers do). As similar to previous years, one of the great beauties of the festival was the diversity of activities on offer for all. It was somewhat inconsequential if you weren’t a slackliner let alone a highliner, there was something for everyone to share and get involved. During the day juggling, unicycling, POI, acro-yoga, miniature bike riding, heavy chilling (yes, that is a legitimate activity) and a number of other shenanigans were undertaken. Few due to the weather braved the waterline, and those that were brave enough were generally spat off into frigid water in an unceremonious fashion! Whilst I bustled into my warmest attire and cursed the imminent winter in the evenings, the boulderers amongst us were at the point of nigh sexual arousal by the friction conditions for this time of year. Self-proclaimed as official moral support and spotter I provided superior beta insights and safety marshalling for those with a fetish for wrestling pebbles. On both nights Caitlin Louise instigated fire jams after dinner. The night owls’ talents of fire staff, POI, ropes and fans were on display to the accompaniment of drums and didgeridoo. Andy Court gave a wonderful debut fire breathing performance, keeping the crowd with baited breath as he taunted his facial hair with a firey trim. It was inspiring to see Kai and Rogan Samuelsson (10-and-three-quarters and 7-and-two-thirds years old respectively) heading out for a zipline across the highlines, and I noticed their keen enthusiasm and rapture over the entire experience. Later that evening I caught up with Kai around the campfire and was delighted to hear that he was keen on progressing his slacklining with the aspiration to possibly attempt highlining the next year. 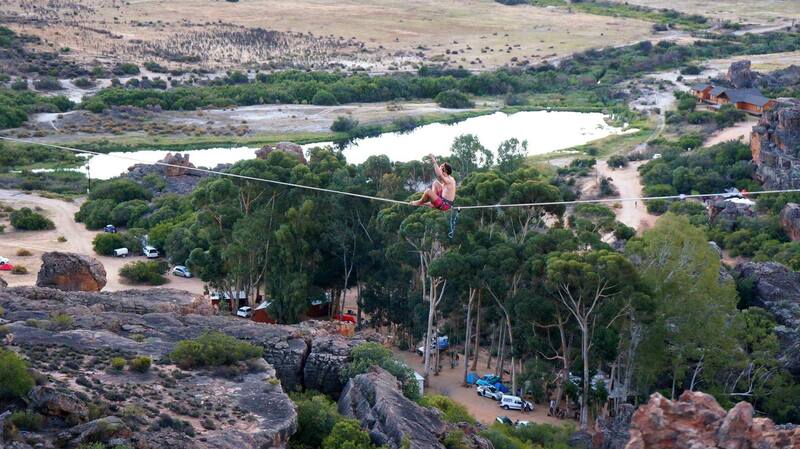 It is this kind of young enthusiasm that will take South African slacklining and highlining to the next level. Although it was definite to myself and others that were close to Sylvain that his absence in the hills was present, it was still inspiring to see the community come together, and hopefully see its further expansion in the future. We have had the pleasure of visiting American Bria Shurke returning to our festival, whereby she deemed our festival both the most welcoming community and safest in terms of rigging. 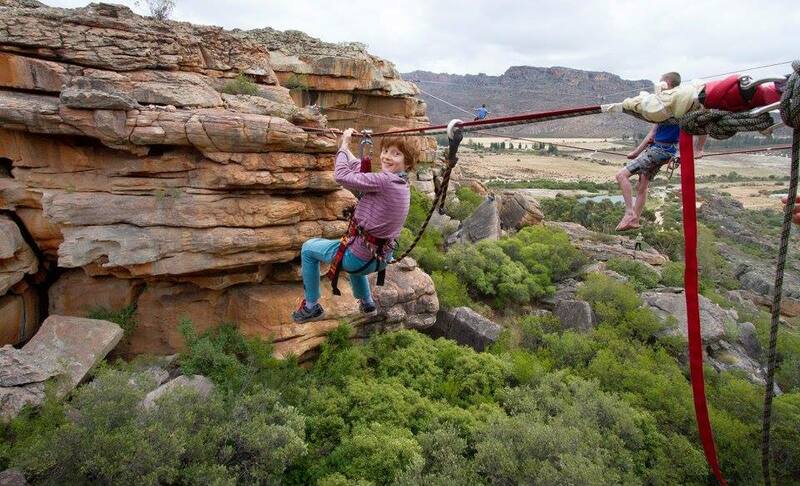 This came as quite a compliment as she has attended numerous international highlining festivals! 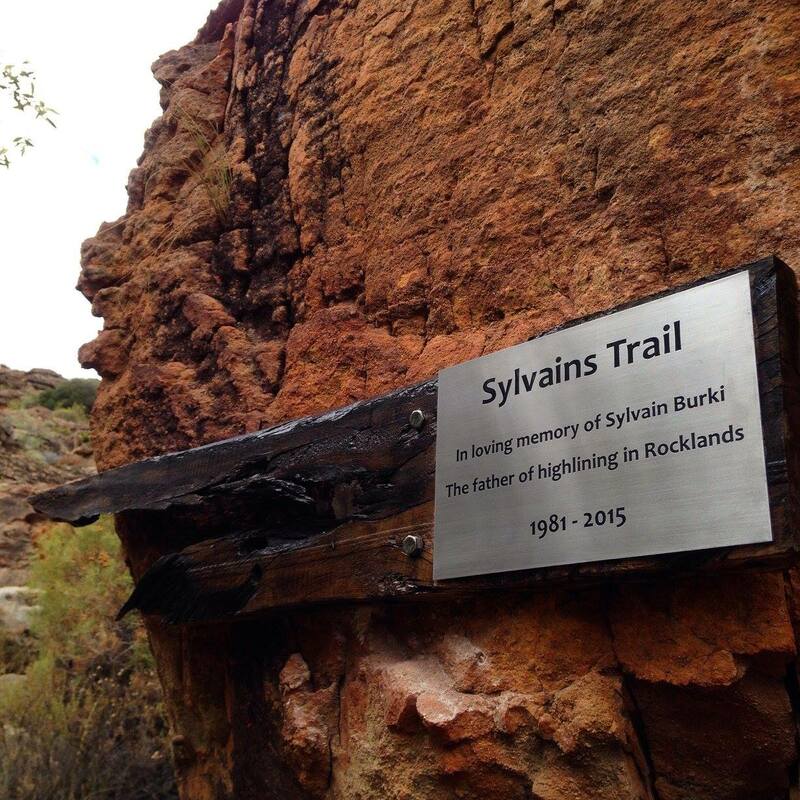 The owner of De Pakhuys, Thys Kruger, installed a beautiful plaque in memory of Sylvain at the entrance of the trail leading to the highlines. Thank you Thys, for both your hospitality and empathy. By Sunday I was beginning to walk like a cowboy from one too many catches on the highline; my inner thighs aesthetically resembled an abstract artwork in pink, blue and purple hues. I was battered, dusty and ready to head homewards, but ultimately highly satisfied with a lovely time out in the magical Cederberg. Thank you to everyone, from those that helped organise to the bystanders, who all made the event a beautiful experience. In particular, a massive thank you to Charmaine Retief Kritzinger for continuing with the organisation and management of the highline festival in true style and finesse this year, all in attendance deeply appreciated your hard work! Another beautiful day in the Berg! Another day of work as an OddWheeler. I stroll down the road for my morning coffee and then meander into the office. Open my computer to start my daily duties. On this particular day I started on Facebook because I wanted to upload photos from Sunday’s Park Play Session, which I still haven’t done. I did a quick scan of my feed and come across a slightly disturbingly vague post which immediately prompt me to phone Charmaine, the partner of my friend Sylvain. The news was devastating and tragic! With barely anything being said, the tone in Charmaine’s voice had confirmed my suspicions. Sylvain was gone!!! He has left this earthly realm. After dealing with the death of my father I thought that I would never be wobbled as easily again. However Sylvain’s death affected me. He would be the first friend to cross over. The easiest way to explain why I was wobbled is by telling you what our connection was…. Both coming from the Film Industry, Sylvain in Stunts and Rigging and myself in Wardrobe / Costume, our paths crossed on a commercial shot in Noordhoek. In true Cape Town film style it was a service job for an American product. The commercial was a bootcamp vibe. I remembered walking across the massive field towards Sylvain. There must’ve been a Wardrobe / Stunt conversation that had to happen. 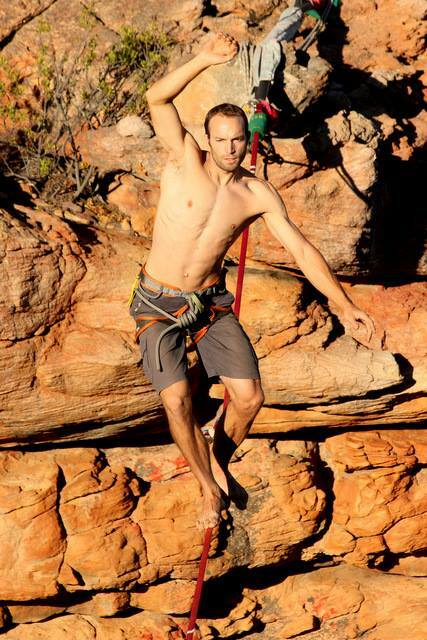 This in turn lead to the discovery of him being into Slacklining, but more specifically Highlining and that he has a company called SlackGear and that he makes lines. Obviously my hobby and new sideline business, OddWheel Unicycles was unveiled to Sylvain. I was a Unicyclist and I had a company that specializes in unicycles but also sold slacklines. We had a kindred interest in balance and developing our communities and businesses. This was our introduction. Today, after being out of the film industry for 1 full year running OddWheel full time. I find myself yet again on a film set in Constantia. Fulfilling the role of an Electric Unicyclist and not a wardrobe assistant. Waiting for when ‘they’ use me, if ‘they’ use me. The circus I left behind to pursue happiness and be apart of a real circus community. With ample time to kill I am writing the start of this post on my phone. Since taking OddWheel over I had to explore ways of making this business viable as it could not survive off Unicycling alone, one of the hardest balance arts to master. 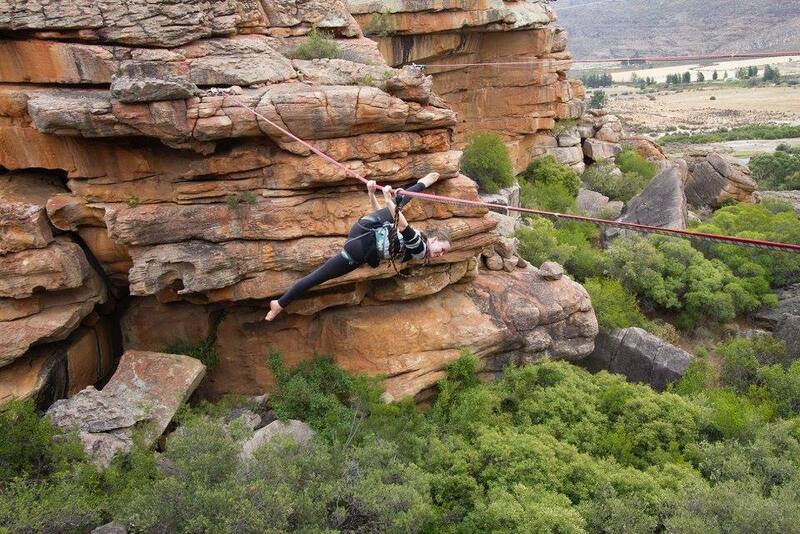 It takes a strong-willed individual with a mindset that invites challenge coupled with perseverance, as does Highlining, Longlining and Slacklining. This exploration led me on a path to connect with the communities that embrace this way of life. We are a vast pool of communities spread over many arts which collectively are the Balance / Flow and Cirque Arts. The circus I feel most comfortable in and welcomed! Sylvain and myself by default are leaders in the balance aspect of this collective and worked together and singularly to grow, connect, teach and inspire these art forms. What sealed our connection is when Sylvain invited me to the first Rocklands Highline Festival in March of 2014. I leaped at the opportunity to connect with this community and this phenomenal man. The crossover is perfect and continues to work. Without realizing it, attending the first Highline Festival made a huge impact on my life and it’s path. Sylvain was an integral part of my current path. In the weeks that followed I attended Sylvain’s very small and intimate service where he was cremated. I saw the pain and heartache that his closest friends and family were experiencing. It was so familiar. December came and went. On January the 23rd, 2016 I attended Sylvain’s Celebration of Life at the Swiss Club in Green Point. There were so many people! It was casual, light, heartwarming, emotional and tear jerking. Sylvain’s closest friends and family spoke of his wonderful life. It was beautiful to hear the antics of Sylvain Burki, as a boy, as a brother, as a son, as a musician, as a climber and as a highliner. Echoing the attitude Sylvain lived his life by, always smiling, laughing, teaching, sharing and giving. He lived a full life, not a moment was wasted. Everything he did was to the best of his ability, to perfection and of the highest quality. James Taylor edited a beautiful video of Sylvain’s moments that were either captured on video or as photo’s and the soundtrack was Sylvain playing the didgeridoo and guitar. It was a day of healing for the people that Sylvain had left behind. But we couldn’t end it there. I still wanted to honour Sylvain’s memory. 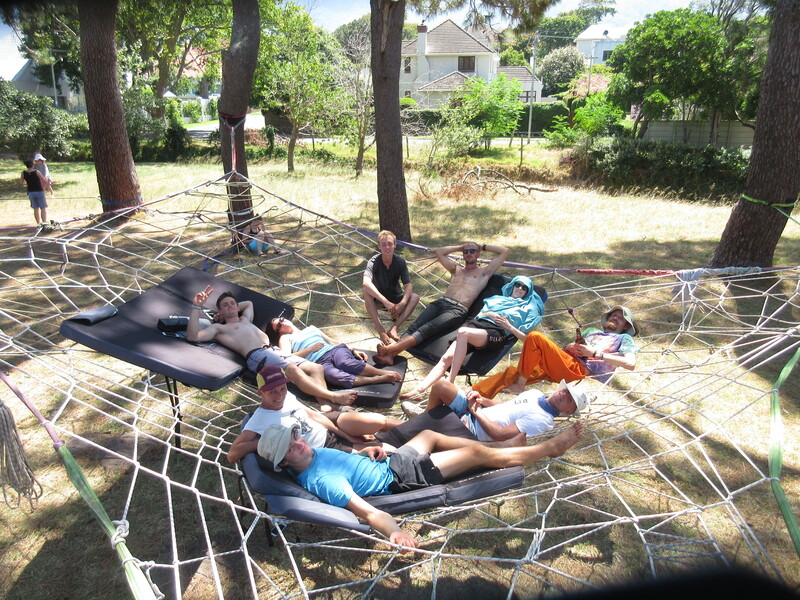 Around April / May 2015 I went to a gathering at Keurboom Park that Sylvain had arranged. It was a day of playing in the park with our toys. It was so much fun to be in that world again. I chatted to Sylvain about setting up a Facebook event that would happen once a month; this was to become Park Play Sessions. 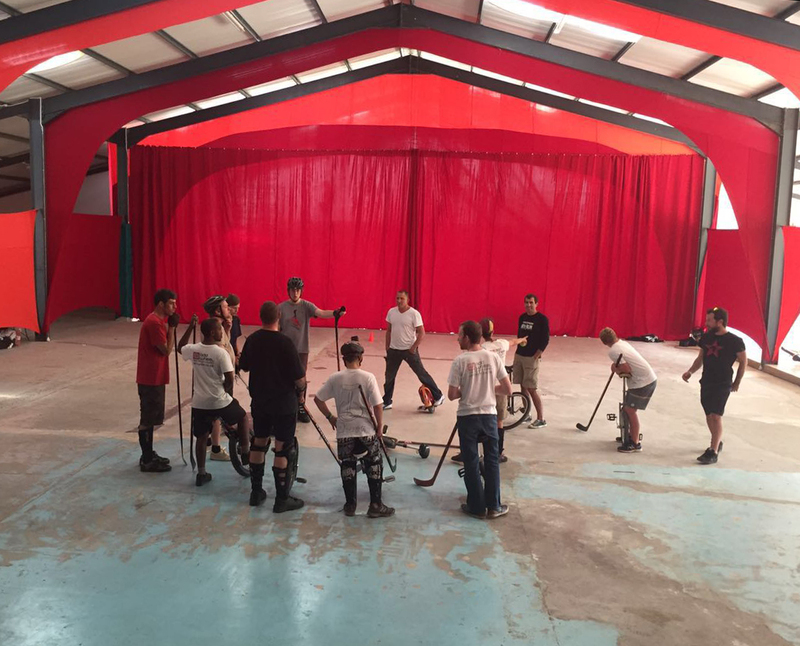 Our first official session was held in June 2015 and continued month after month. I actively invited as many communities that fell into the balance / flow / cirque world’s. Every Park Session is awesome with so many talented individuals coming to play, share and teach. It got big quickly and is now frequented by Slackliners, Jugglers, Unicyclists, Yoyoist’s, Acroyogi’s, Aerial Hoopist’s, Poi, Staff and Hoop people. I didn’t know it at the time but the PPS held on December 13th would be the last time I hug Sy. He died on the 14th from a shallow water blackout in his pool at home. Damn shame! I thought long and hard about what could be done to honour Sylvain’s memory. I asked as many people as I could for advice. 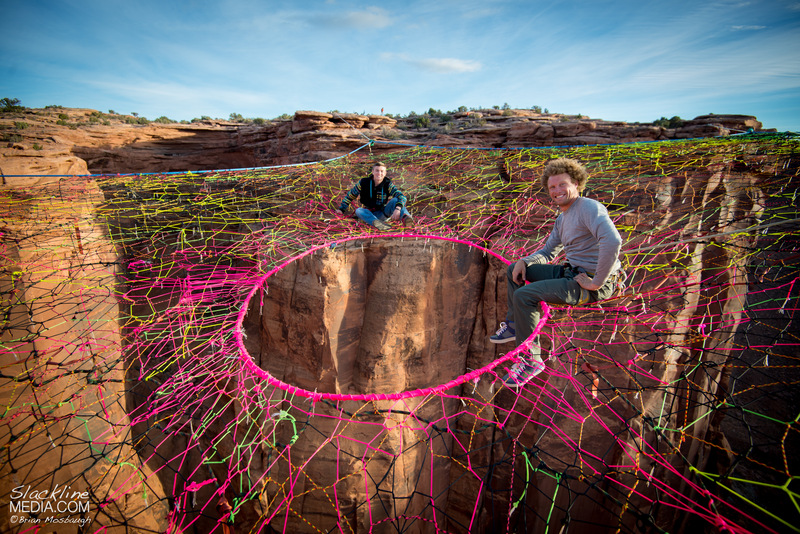 It needed to include the community that was birthed through Park Play and Slackgear. After Sy died photo’s started circulating of him. Craig Fox had taken a photo of Sylvain bouncing on a small spacenet that himself and Andy Court had built at the October PPS. I spoke with Charmaine, Andy, Mr Dicks and Lyle to bounce my idea off them, “Let’s build a giant spacenet for Sylvain”. Admittedly it didn’t take much convincing, we were all in agreement and therefore it will be done. A good old Whatsapp group was formed to start figuring this brain fart out. Gear was discussed numerous times. We did a little test build 2 weeks before the January session just so we knew what we were in for. We felt pretty confident that we could pull it off… and did we! Sunday morning, it’s Park Play day, no it’s spacenet day! Chris and myself arrive at a sparrow’s fart whilst the rest of the team starts trickling in from 9am. We were a core group of roughly 10 people that started actioning the build. 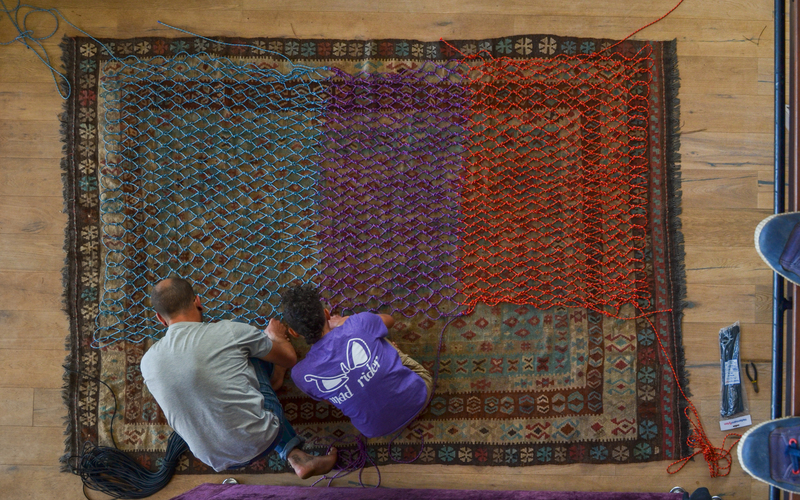 As the minutes ticked past we continued to weave Sylvain’s dreamcatcher. Sessioners trickled in and got involved. People helped where they could. The result was exactly what I had hoped for. Sylvain’s friends gave their time, energy and gear to manifest something as grandeur as he was. We collectively created a heart space that held his very essence. It was filled with fun, joy, laughter and love. Like I said, exactly what I wanted! I will openly admit that I know next-to-nothing about climbing and rigging. I’m the unicycle expert. What I can do is give you a brief idea of what it took to build Sylvain’s Spacenet. 3.5 Hours to build and 1 hour to de-rig. Lank 1 & 2 ton slings to make up the circumference of roughly 5/6 metre’s squared. We eventually decided on a square because of the tree configuration. Just over 500m of static line to weave the dreamcatcher. Baboon locks, Rhino locks, soft links and various shackles. Dyno-something-or-other, for measuring the forces when people are on the net. Between 6-7 people was the limit, and yes, the 2 children did count as 1 adult. Many willing, loving hands with bodies. Here is a photo album of the day on Facebook. Something that really touched my heart about Sylvain’s Spacenet Send-Off was that both his parents, Hedi and Ernest came to the park to enjoy the community that Sylvain had helped create. It has been a difficult time for them wrapped up in intense emotion. Hedi and Ernest, Sylvain was amazing with so many incredible qualities that could only be attributed to the both of you. He was a precious gift. I feel overwhelmingly honoured and spoilt to have known him for the short time that I did. Sylvain you rocked our worlds! Thank you for being an inspiration to us all and for teaching us so much! Dude, you will be missed… but never forgotten! Just so that everyone is in the loop, SlackGear will continue. It has been kindly handed over to Charmaine Retief Kritzinger who stood by Sylvain’s side for the last few years as his partner. 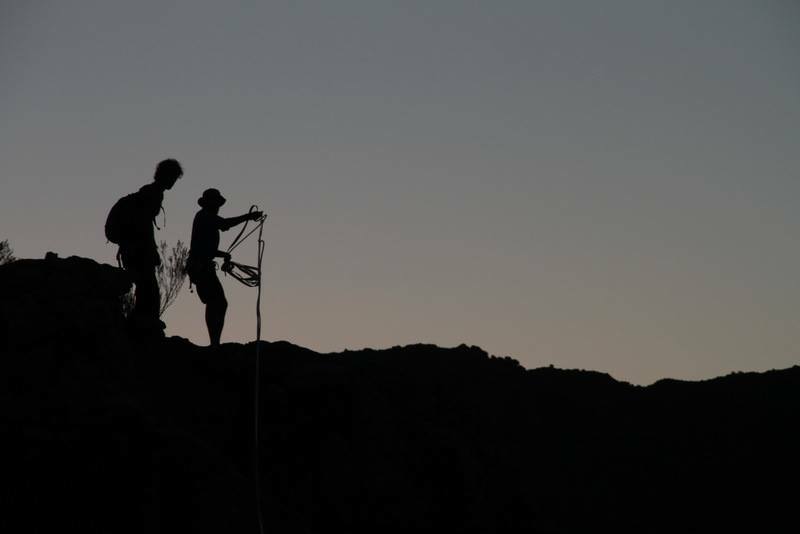 She pretty much shadowed him and I would imagine knows the smallest details about SlackGear that only a partner would know. We support you on your new path Charmaine, unquestionably. Go for it girl! 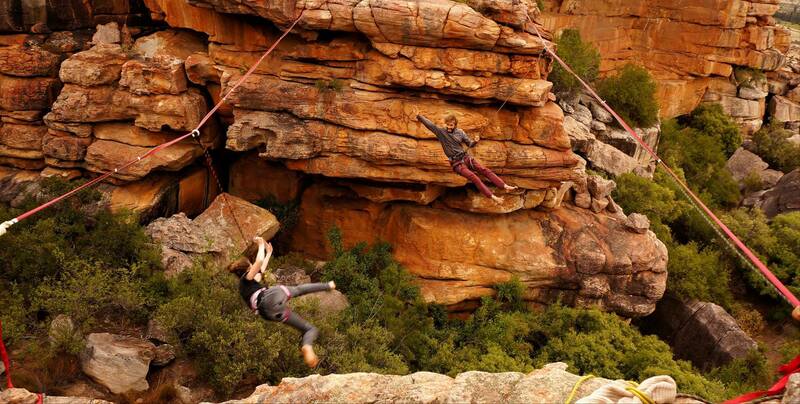 If you into Slackline, Longline or Highline then get your buttocks down to the annual meetup happening at Rocklands over the Easter weekend. Click here if you would like to find out more about the weekend. I would highly recommend it! 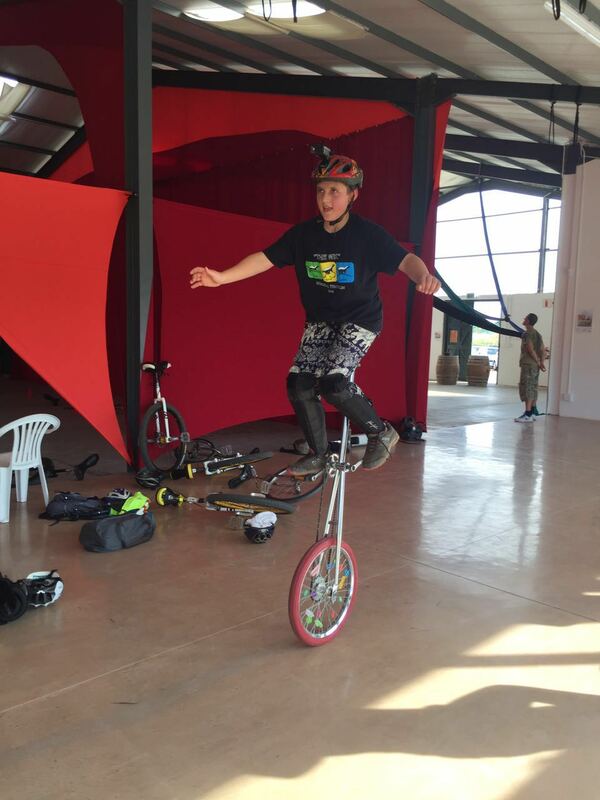 We all know that Unicycling is a challenge when you embark upon learning this balance skill. Mastering it takes perseverance and dedication of the mind and body… but mostly the mind. During my life I have never experienced as much joy and reward from something as Unicycling has given me. Actually I can think of one other, Juggling has given me the same pleasure. 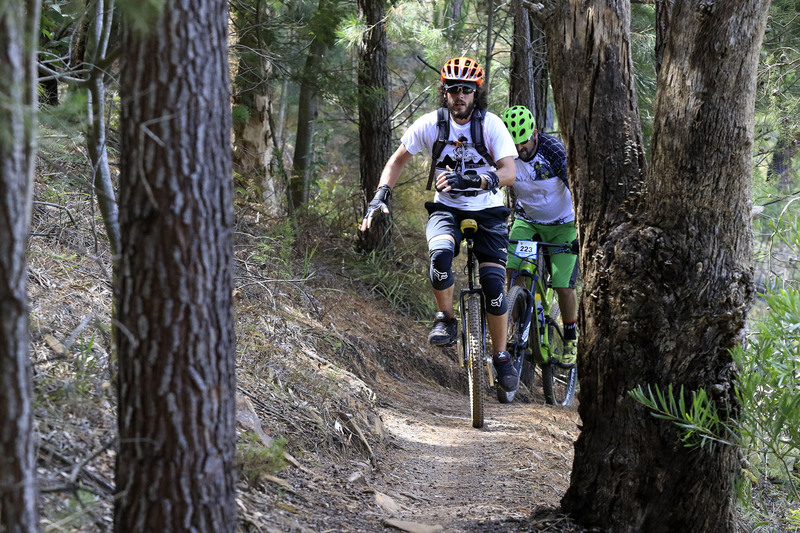 Most riders who have been bitten by the Unicycling bug try do at least one long distance road race. It’s one of those ‘I have to do things’. I recommend the experience to all Unicyclists regardless of the discipline you pursue. 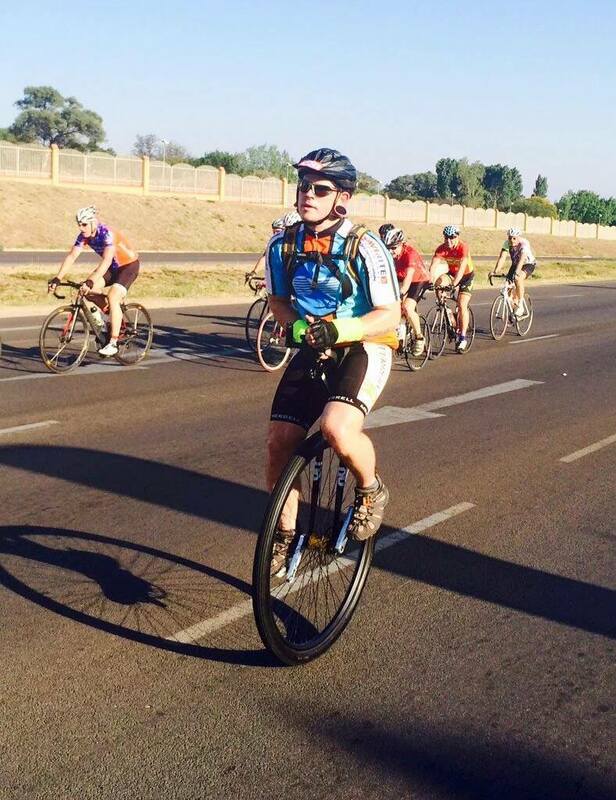 This year saw 4 Unicyclists participate in the Momentum 94.7 Cycle Challenge in Joburg. 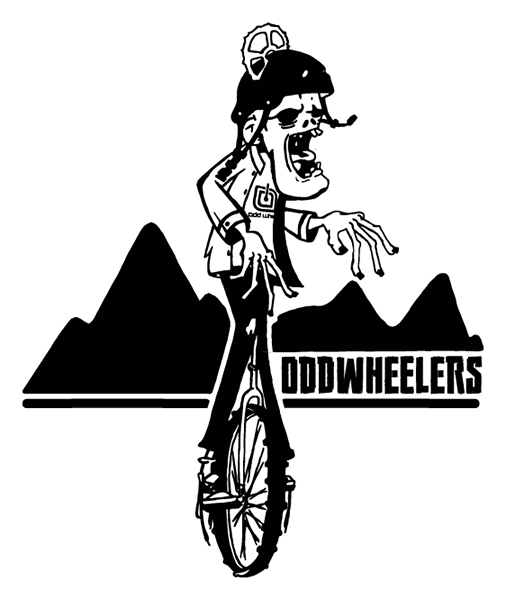 As a community we ‘OddWheelers’ support a charity, not for the sake of supporting a charity because that’s the cycling ethical thing to do. We do it because this ‘charity’ is part of our community. We are literally friends with Shaun, Leigh and Nic Murphy. They are our family and family stick together. 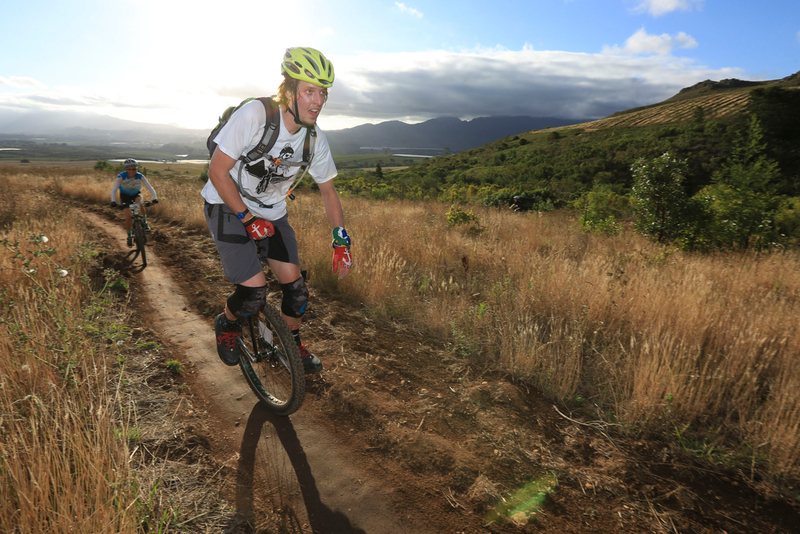 So without further suspension I leave you to read the accounts of these 4 Unicyclists and their experience of the race… but first we need an introduction from our charity. Almost thirty years ago five middle aged Californians sang with wanderlust about Aruba and Jamaica. In fact Bermuda, Bahama as well as a pretty mama were made mention of in a classic tune that promised a sunlit journey to a beach paradise filled with sun kissed bodies and tropical beverages. It was the late eighties, Tom Cruise was slinging cocktails and the thought of living near the ocean was nothing but a daydream for a freckled faced Jozi boy donning a brush cut. 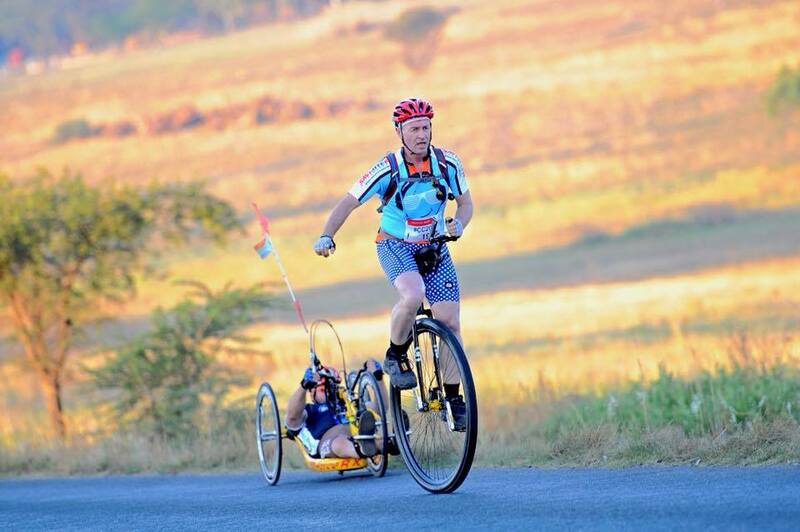 The 2015 edition of the Momentum 947 Cycle Challenge was a special one. Apart from being our main fundraising and awareness campaign for the calendar year, it was also our fifth consecutive race promising a fantastic turnout. 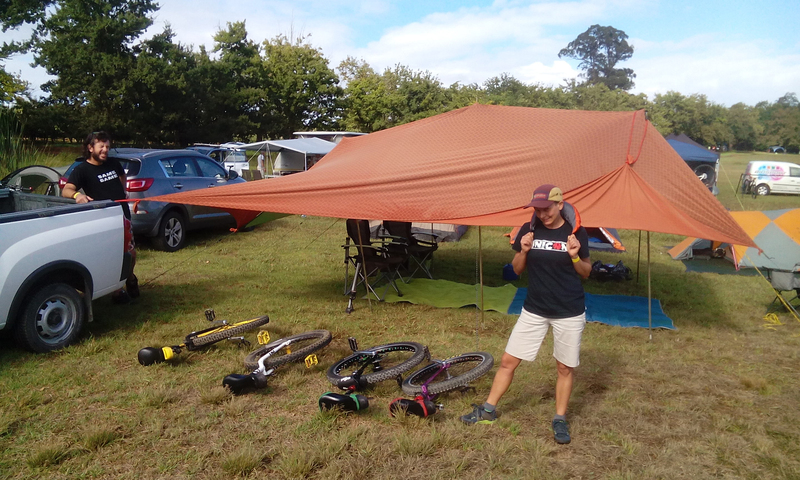 We were not disappointed…our initial team of three had swollen to 88 riders. In our bid to show that doing something differently can still award the same results, we had four members of the unicycle community join team auSOMEtism, a tridem (three seater bicycle), a tandem, and a couple of tall bikes joining the party. Let’s not forget Johnny Two Loops that upped the different factor by riding the challenge twice. What a party it was! A persistent knee injury kept me off the unicycle this year, but drawing inspiration from another madman and his mighty Cogzilla I attempted the race on a tall bike which I lovingly dubbed the Bigbird. The tall bike came with her own set of challenges. Bigbird is a far cry from the aerodynamic carbon steeds that you might find cycling Le Tour. No sir, she is more likened to riding a large pocket of potatoes who enjoys popping wheelies on any sort of incline (which there are no shortage of in the mean streets of Johannesburg). That being said, she was a surprising pleasure to ride. I was treated to the most spectacular views, fantastic camaraderie from fellow cyclists and the wonderful ability to freewheel, which is a luxury not enjoyed by the unicycle crew. Johannesburg offered up hot and windy conditions making cycling tough for all the competitors. We all needed to dig a little deeper, to look for something extra, to grin and bear it. I couldn’t help but think of the kiddos and adults on the autism spectrum who are asked to fit into our society’s norms. Different abilities, lack of verbal communication and sensory overloads are majority of the time expected to be swept under the rug to appease the masses. Here at auSOMEtism we don’t like to sweep things under the rug. We tackle challenges head on and let our different abilities shine through it all. If I can take one thing from riding Bigbird in the cycle challenge it was the overwhelming positivity I experienced from my fellow riders. Imagine a world where all our differences where given the same positive attention. The Bigbird and I achieved our goal of completing the cycle challenge and hopefully more than that we helped show in some small way that not everything needs to fit into little boxes, it’s OK to colour outside the lines, that being different doesn’t make you any less. Almost thirty years ago five middle aged Californians sang about getting there fast and taking it slow…we are happy to just enjoy the ride. My good friend Alister Buhler pestered me for over a year to get into unicycling, eventually giving me a 24” muni on condition that I learned how to ride it. And so it was that on the 1st of January 2014 that I committed myself to learning the art. After 2 months I remember riding my first 100m and my thighs going into such lactic spasm that I couldn’t imagine anyone taking on 10km, let alone the likes of the Argus (can we still say that?) or the 94.7. A couple of months back a friend was selling his 36er and I took pity and gave it a nice home. When Al heard this he dared me to ride the 94.7, and I rose to the bait. The voices in my head are still arguing which one was responsible for that decision! They say that time waits for no man, and 15 November rushed up on me, so with a total of 275km ridden on the 36er, 200 of which were in the last month, and still not able to free mount properly I set forth to conquer the infamous 94.7. Seasoned veterans David Eave and Wayne Lotter met me at the starting line before sunrise. Zakk also rode but left in a later bunch. I was no match for the other two as they quickly disappeared up the road – and up it was. I didn’t realise Joburg is quite so hilly. I settled down into a steady rhythm of 4 min/km while pacing and bracing myself for 6 and a half hours in the saddle. I had a bit of a wobbly between 25 and 30km when I just couldn’t get comfortable on the saddle but we soon got off the freeway and into the suburbs and the crowds were amazing. The cheers and chirps buoyed the spirits and I rode on. 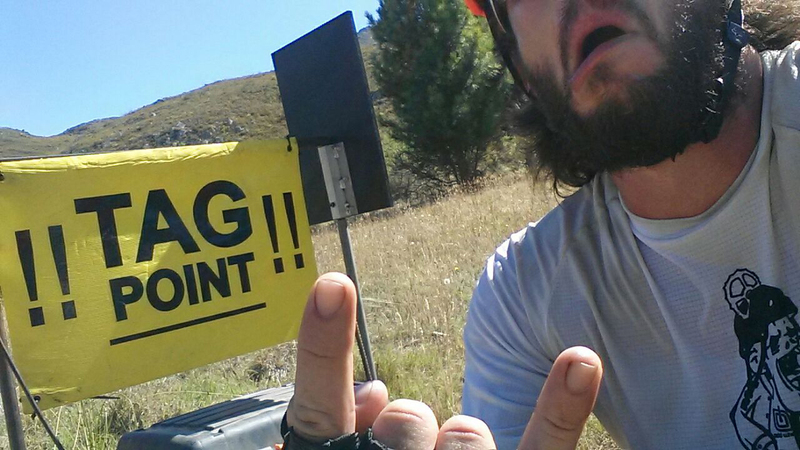 At 60km I was still on for a decent sub 7 … then the wind hit me. Oh boy, did I suffer?! My inexperience on a single wheel got shown up big time. The hot, gusting, blustering, swirling wind meant that most of my energy went into staying upright rather than going forward. With about 30km to go the course emerges from the suburbs and heads out into the open grasslands where there is no hiding from the wrath of the wind. For 20km we rode into the teeth of the wind, then we turned at right angles and it became a crosswind. Well someone up front must have said something to piss the wind off because by the time I was there it was no longer just cross, it was bloody furious! My skill levels were just not enough to keep the big 36er straight on the narrow road and I was becoming a hazard to other cyclists so I had to walk for quite some distance. It was a soul destroying, lonely walk on the dusty side of the road. I was exposed like a raw nerve. No shelter, no companion, no support and no alternative but to carry on walking! And then I remembered why I was doing this … for auSOMEtism. I got to do some serious thinking and I was reminded that autistic people face overwhelming challenges every day and my little puddle of self-pity evaporated into insignificance. With renewed determination I mounted at the next handy signpost and battled on in the cross wind on the gravel roadside until the route aligned itself with the wind again and I was able to safely navigate the tar once more. I finally rolled over the finish line a couple of seconds under 8 hours, broken and humbled but with an incredible sense of achievement and gratitude for the amazing generosity and support from so many people. All started well, at Northcliff Cycles on Beyers Naude at least. As I was inflating the tyre to pressure with their pump I received a call from Vince Gibbons Productions. “You are on SABC2 right now!” Northcliff Cycles changed channels and there I was unicycling all over their wall. A unicycle with a backdrop of many bicycles. So, customers and staff took a break and we all watched a unicycle segment on SABC TV. I was pleased that AuSOMEtism got several minutes of exposure on the day before the #947cc_2015. After the segment I naturally promoted unicycling (no stock in the shop), explaining the challenges and the joys, however, I failed to win any converts even with an offer of a free unicycling clinic. Armed with the fresh images of myself on TV I prepared myself for fame and glory. As a limited number of people (none) asked for a “selfie opportunity” I realised that the public are naturally shy and did not want to compromise my final pre-race preparation. I am sure that you all realise how emotionally draining all this media exposure is. Can ruin a perfectly prepared training programme. 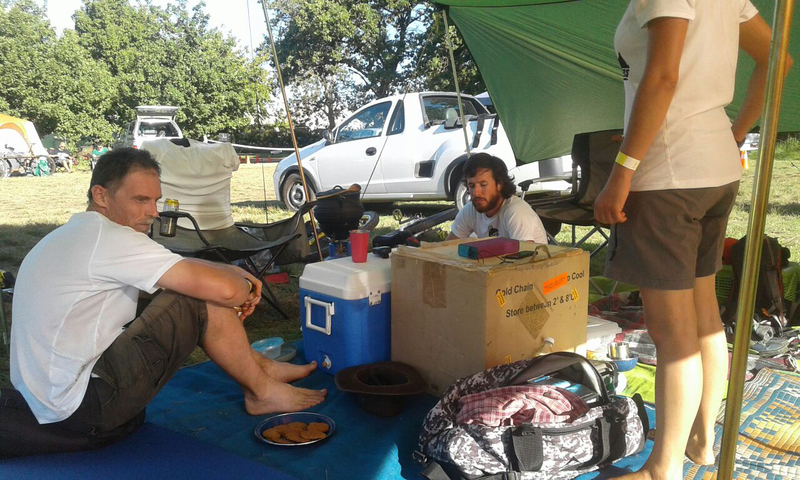 Race-day was an early 03h00 rise with breakfast and dressing done by 03h40. Packed the uni in the car after another check that all the bits are packed. How many times do you have to make sure that your helmet and race timing chip are packed? As with last year a TV crew was to make a documentary and would meet me at Riversands at 04h50 at circle 4. Departed on time at just before 04h00. Malibongwe is bust all the time so finding Riversands should not present a problem. As with the Argus just follow the car with the bicycles that is in front of you. No cars with bicycles could I spot. Plan B: Drive down Malibongwe (long way), right into Witkoppen (busy intersection – you cannot miss the turn) and then left into William Nicol and then find the yellow parking area. All in the dark with no GPS! Relief finally spotted a GP number plate with a bicycle on Witkoppen, only for the car to drive through a red light. Not me, even at 04h15 in the morning. Made the start, gave an interview and finally met up with Gray and Wayne. Good start and climb up Summit into a headwind. Excellent pace past Kyalami onto Woodmead and finally off the M1 South with the challenging Joe Slovo climb. Then something went horribly wrong. On the raised road section of Joe Slovo I hit a major pothole (the road surface virtually the entire route is shocking!) and used reflex effort to avoid an unplanned dismount, just to lose the use of my right quadricep. Walked out the pain and mounted again, however, had to nurse the leg the rest of the way. Remained focussed up the long Homestead climb and managed both Witkoppen and Malibongwe climbs into a fresh hot headwind. The Malibongwe climb experience parallels Blue Down on Argus day with many children wanting chocolates. The turn onto the R114 (past the Lion Park) at the top of the Malibongwe climb demanded my last reserves. This is a 3km gauntlet of poor surface, spoilt veld with fire, litter, poverty and a strong crosswind. I managed to stay mounted all the way to Cedar as I realised that a re-mount may not be possible with the crosswind and bicycle volume. 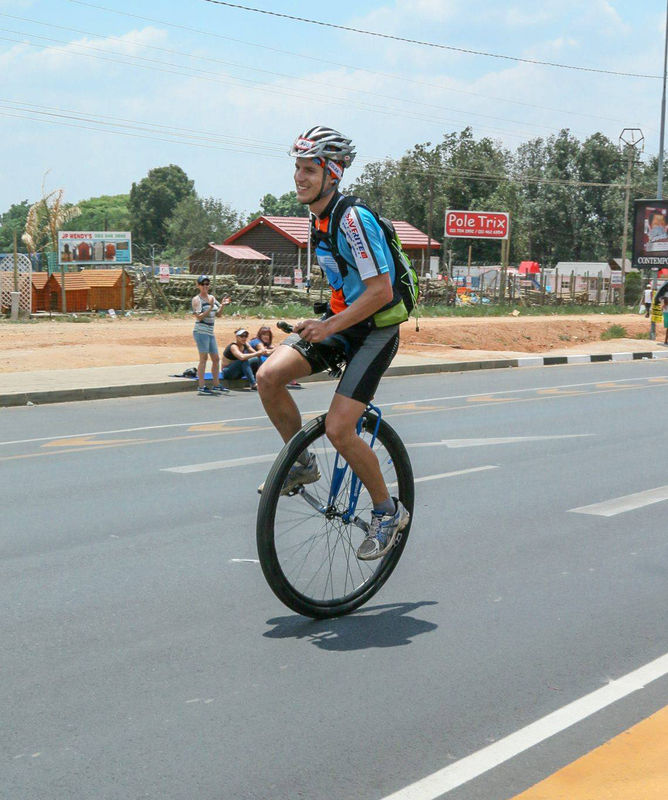 The Cedar climb was the last test, however, I was unable to unicycle up Riversands Boulevard to the finish. I sat on the pavement in brutal heat and wind unable to complete the last 2km. Finally a cyclist insisted that I walk with him to the final circle. The last 1.7km I managed in 24 minutes 30 seconds. 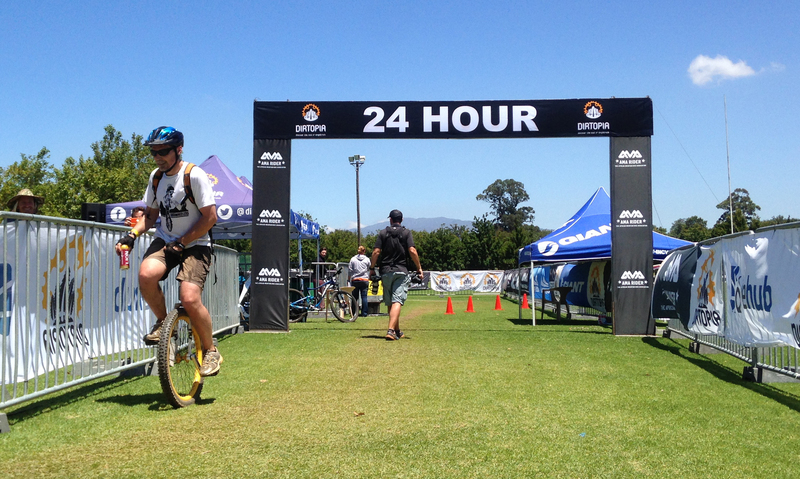 The finish line provided no respite from the heat and wind. Dust was the beverage of the day and shade non-existent. The AuSOMEtism courtesy tent provided the only relief. 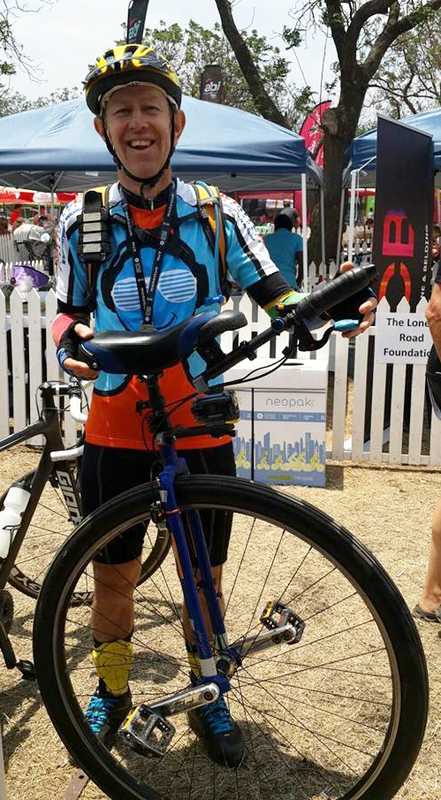 Shaun – thanks for the life saver you organised and thanks to Cell C for recognising us. 947cc_2016 – I will rethink the need to accept the challenge of the Nelson Mandela bridge approach and the “Malibongwe Zone”. We started early together with the hand cycles. I was a bit worried about the weather as the previous few days were scorchers with Gauteng being hit by a major heatwave! 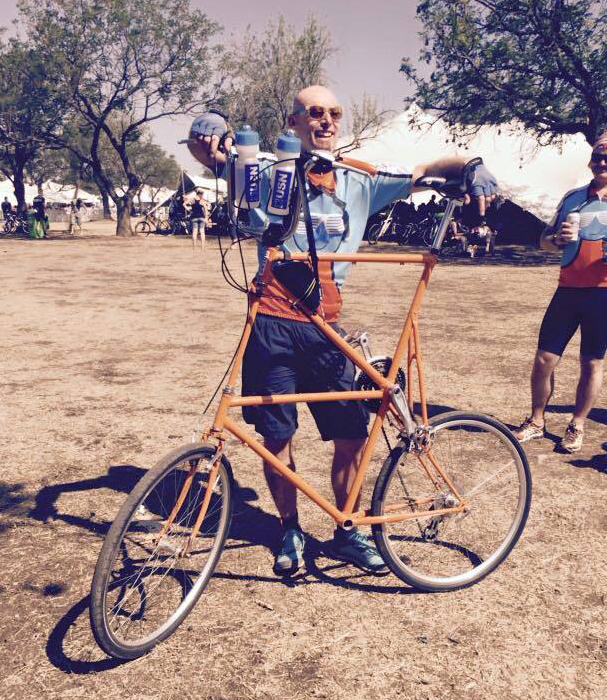 The Unicycles united at the startline and David Eave shared some wisdom about the Tim Noakes diet. The usual startline chatter about preparation training and muti you were going to use for the day made sure the time flew by. Next moment the gun went off and it was GO TIME!! It was a lonely ride from the start as the Uni’s split up, each with their own game plan. My plan… just to finish the race without having to use my face as a brake. The first half of the race went better than expected and one water table after the other passed by. One of the scariest moments in the race came as the leading women peleton came swooshing past me at a pace equal to that of a super space rocket! 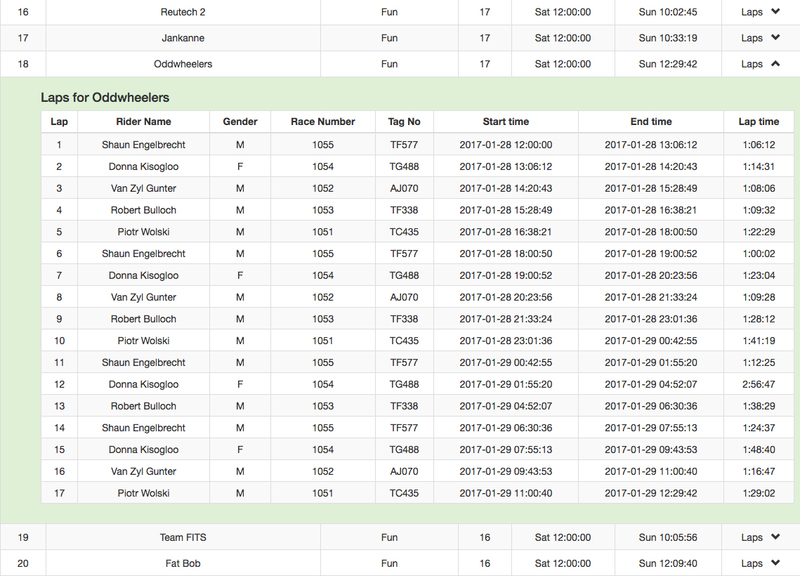 I managed to keep my bib streak free, but it was a close call. The second half of the race came with a combination of three challenges! These being hills, wind and road camber! A combination of 4 challenges, these being hills, heat, wind and road camber. I made peace with the hills beforehand and decided no to waste too much energy on trying to ride all of them. Walking gave the legs a much-needed rest. Hydration was a key point in surviving the heat! The wind and road camber on narrow roads made for more walking than was expected. My body hasn’t been in such a funny position in a long time as I tried to stay on top of the wheel. In many cases it was a futile fight against the conditions and that forced me to walk. This years race saw surprisingly few WYOW (where’s the other wheel?) chirps or maybe I’ve just gotten used to it and not registered all of them. From the 72km mark it was a mental fight. Pushing upwards and onwards, hill after hill after Steyn City hill! The finish line couldn’t have come sooner! I crossed the line and once again survived another 94.7 on 1 Wheel! I collected my medal and was immediately asked for an interview… Out of breath, tired and exhausted. The highlite of the race was the auSOMEtism tent welcoming us with smiles and a cold one! It’s soooo gratifying to see the charity growing from strength to strength each year! Knowing that you make a difference by doing something as simple as riding 1 wheel for 94.7km. Just over a year of unicycle experience in total, on a 24” Starter, and an amazing opportunity arises – a used 36” Nimbus Nightrider is for sale (and at a price I could afford). So a month before the 94.7 Momentum Cycle Challenge, I got onto a 36” wheel for the first time, with my first try being successful. I loved it, and decided this big wheel is going home with me. At this point I was informed that I may ride the 94.7, since there is an entry for the unicycle that I now own. At first it was an impossible challenge – I thought I wouldn’t be able to finish, but decided to still ride since it is for a good cause (auSOMEtism). I decided I’m going to try, and so the training began. 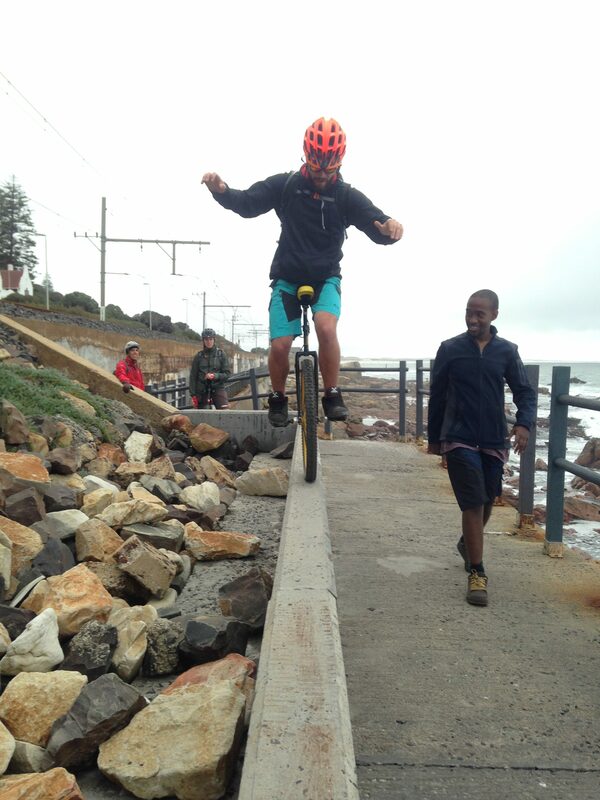 I spoke to Alister Buhler who has done the challenge on a unicycle, and he gave me great tips. Subconsciously the idea of finishing the cycle challenge grew day by day, and by race day I only had one mindset: If I can have my body sustain for 7-9 hours, there is no reason not to finish. I trained for three weeks, and my last ride before the 94.7 was my first with another unicyclist. Wayne Lötter and I did 40km (my furthest trip yet), followed by a week of rest. It’s race day! My first 94.7 Cycle Challenge. On my way to the early start (5:35 AM) my left crank feels loose and I try to find mechanics, only to find out they haven’t arrived yet. In a parking lot I find someone with a 14mm socket in thier car that I can quickly use. Now I’m ready and I rush back, only starting at 5:49 AM, which is not with my group but it is still as early as possible. The first part is lonely out on the road – every few minutes a new group that still feels fresh passes. Only 1km from the first water point my crank is loose again! Not what I need today, but luckily there’s a mechanic and I jump into his toolbox, tighten my crank to death, and the race goes on. Riding is now much better since there are people alongside the road and on bridges, and the support is amazing (and I liked the idea of taking a huge tour on a unicycle through Johannesburg). Sloped road’s and heavy winds forced me to keep balance at an angle that is quite tough riding. Mandela’s Bridge arrives and at 44km my crank is loose again. No mechanic at the water point, no tools. I scramble around, even asking City Water for tools, end up wasting about an hour and I decide there is no solution. They’ve called mechanics many times, yet no sweep vehicles. I thought it might be the end of my race. I decide to continue, actually with no hope, and then I see an elderly couple in the opposite lane on Jan Smuts. I ask if they live nearby (luckily they did), and I end up meeting their gardener, who brought me a 14mm socket, on the next corner to tighten my crank to my absolute max. My fate has changed and I am back in the race. The long downhills are challenging – I have to hold at 14-18km/h while everyone else is freeing past me with great speed. Long downhills, followed by uphills of the same length, was not appealing and this is where I needed motivation. Passing a few bicycles on uphills got me motivated, along with all the spectators cheering as I pass and encouraging me. Only 25km left, I feel close but my body doesn’t. I keep on telling myself I have done most of this, what’s left is not that far, but it was definitely the longest 25km I’ve experienced. With lots of walking towards the end I finally finish a few minutes before 2 pm, absolutely unreal! Gray’s Bratveedt: QX-Series 36, KH Moment 125mm cranks, Disc Brake. Shaun Murphy: Birdbird – custom built tall bike by Whippet Cycling. Zakk Coetzee: Just over 8hrs. Due to bad technology, Zakk’s racechip did not record his time. 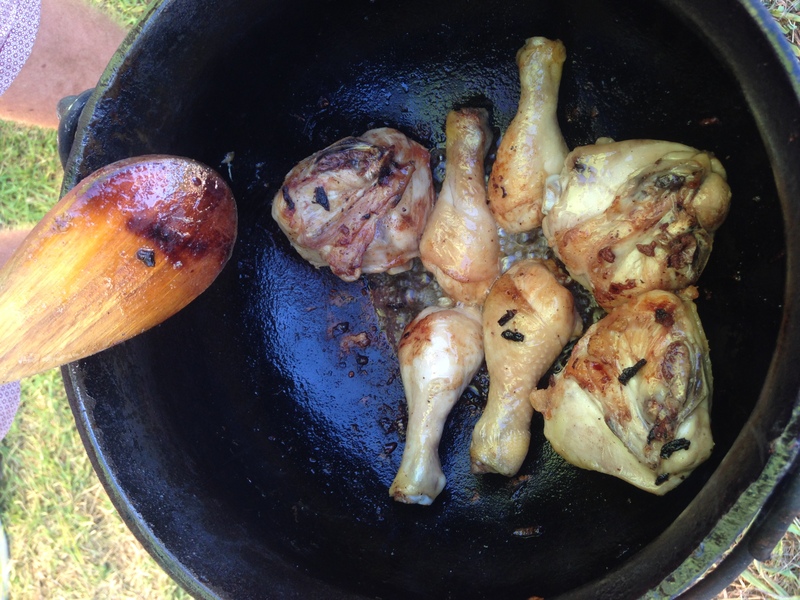 http://oddwheel.co.za/wp-content/uploads/2015/12/12274777_933069823454211_3854696064195598810_n.jpg 638 960 GirleeRyder http://oddwheel.co.za/wp-content/uploads/2015/05/oddwheel-logo-notagline1.png GirleeRyder2015-12-04 15:16:132015-12-04 15:49:36"different, not less"